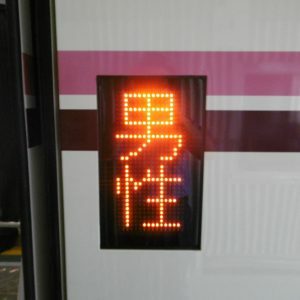 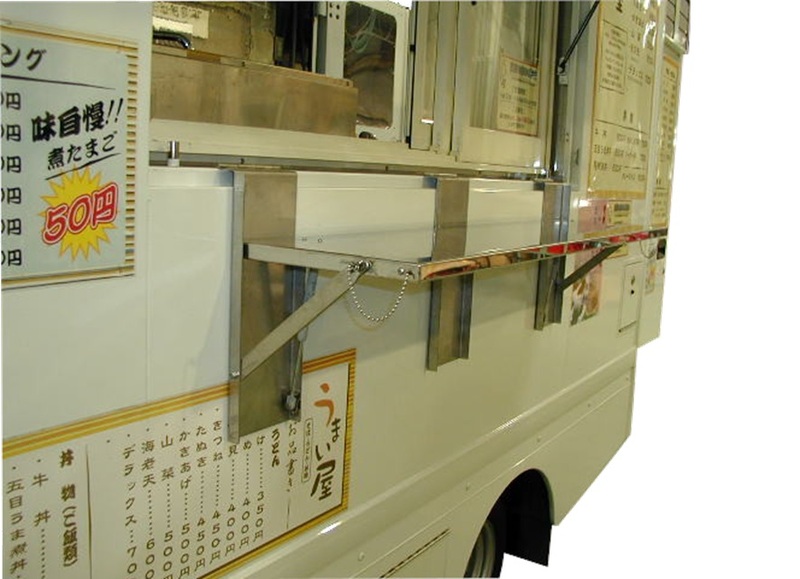 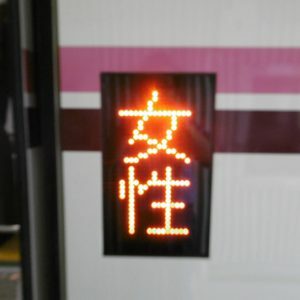 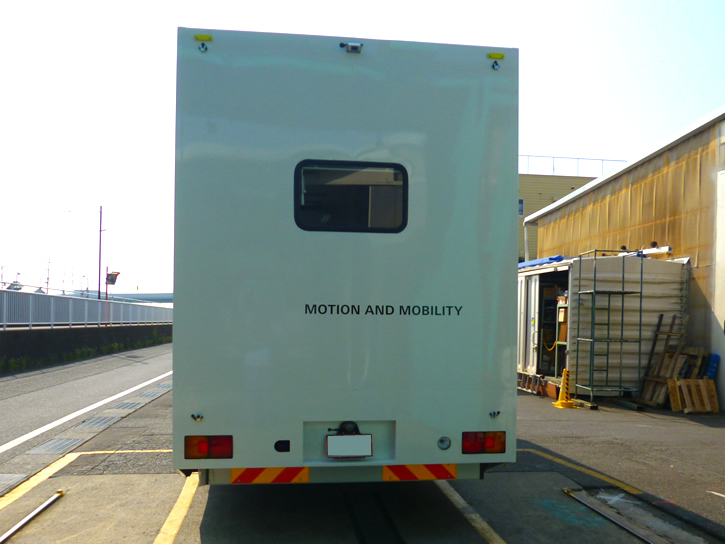 I make a special vehicle carefully.At first, please refer. 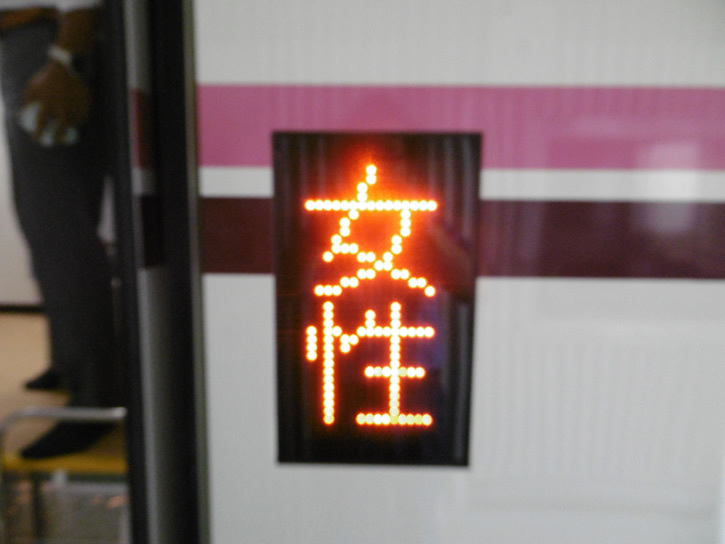 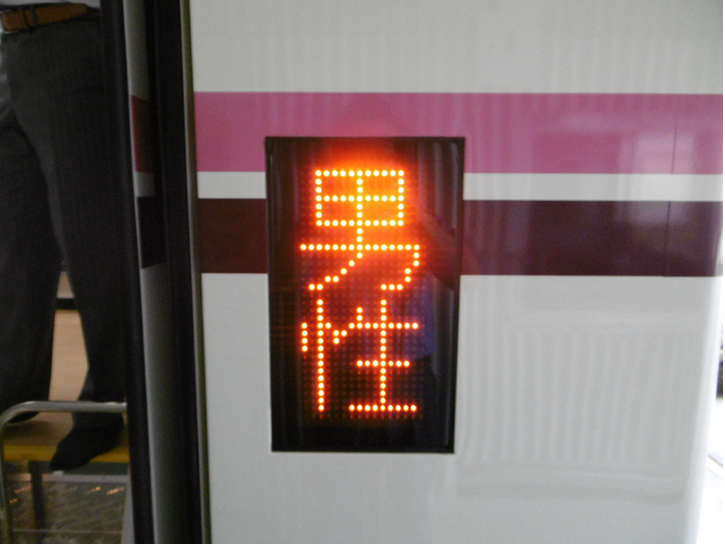 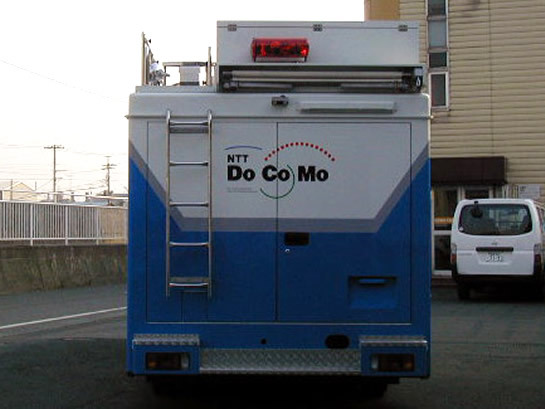 (In Japanese) Let's complete a car to idealize together. 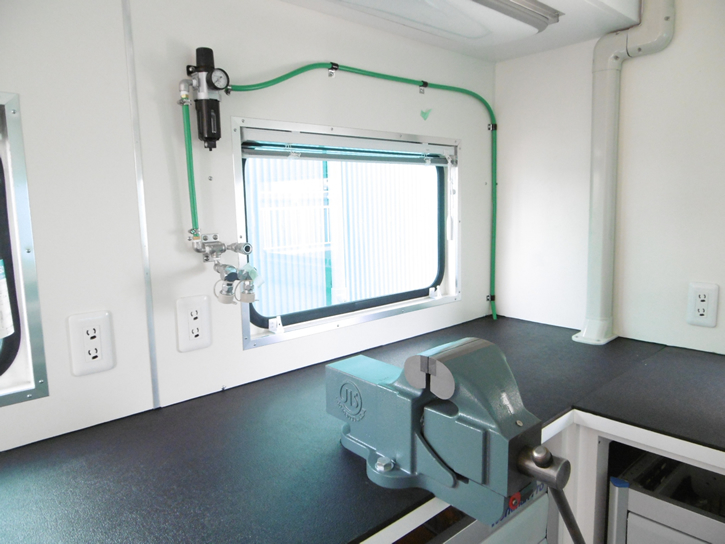 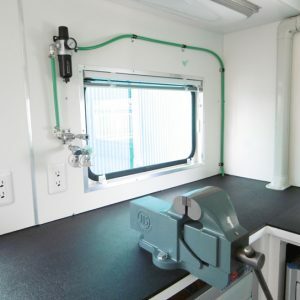 A vehicle that shoots chest X-rays. 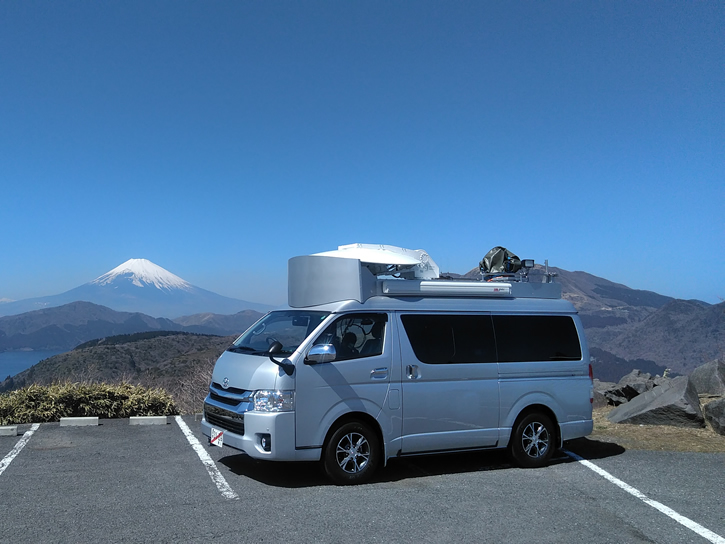 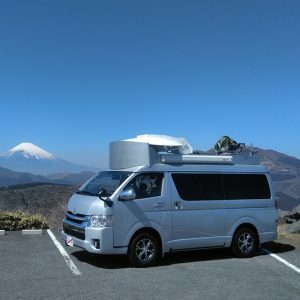 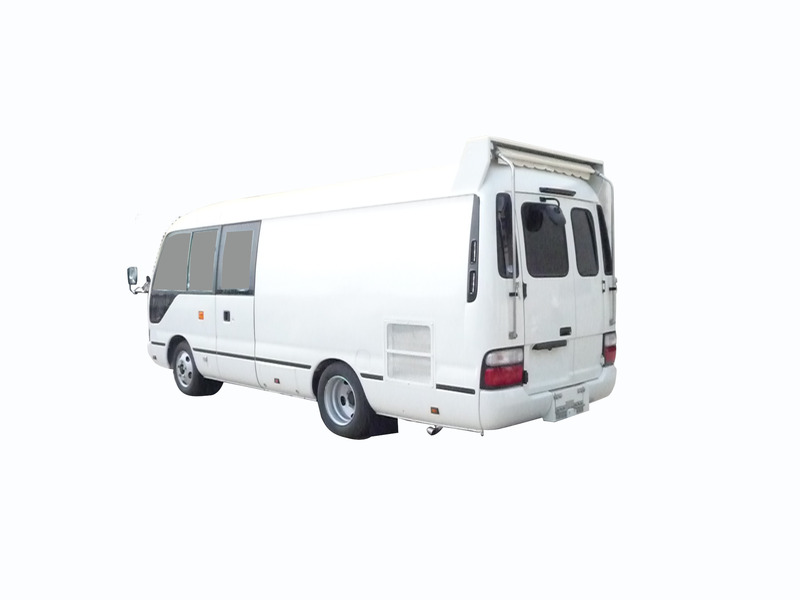 It is possible to produce on track base and mini bus based. 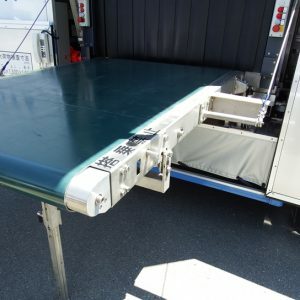 Vehicle to be inspected for barium in the stomach. 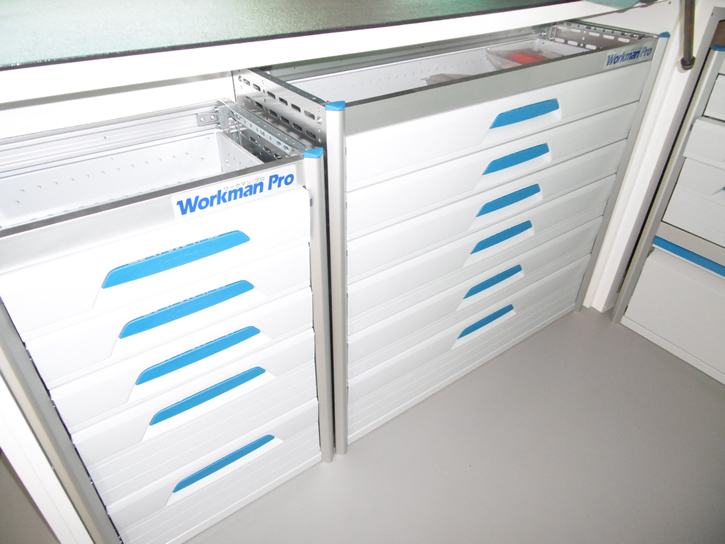 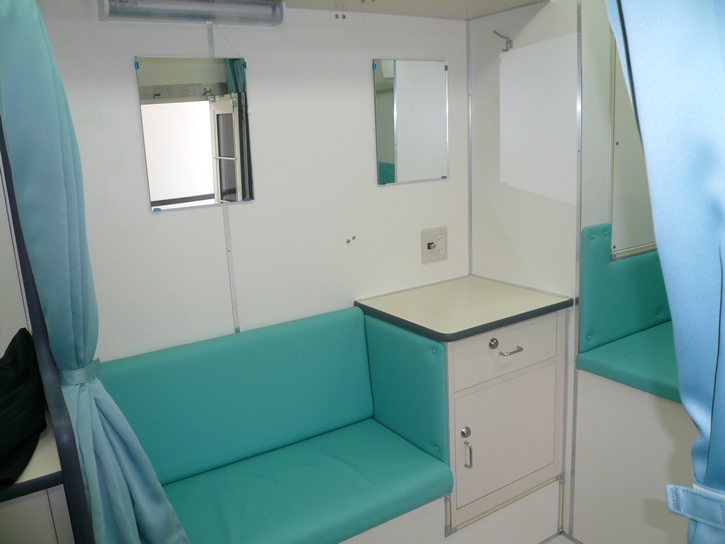 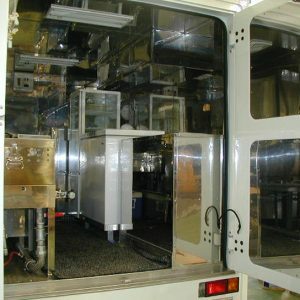 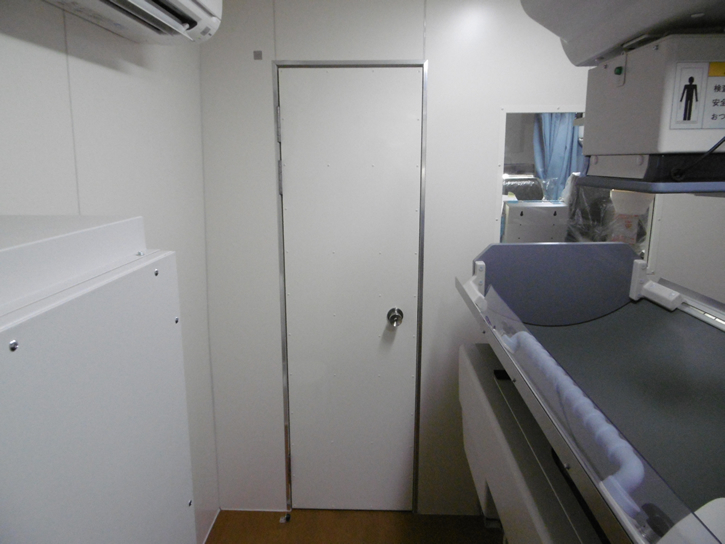 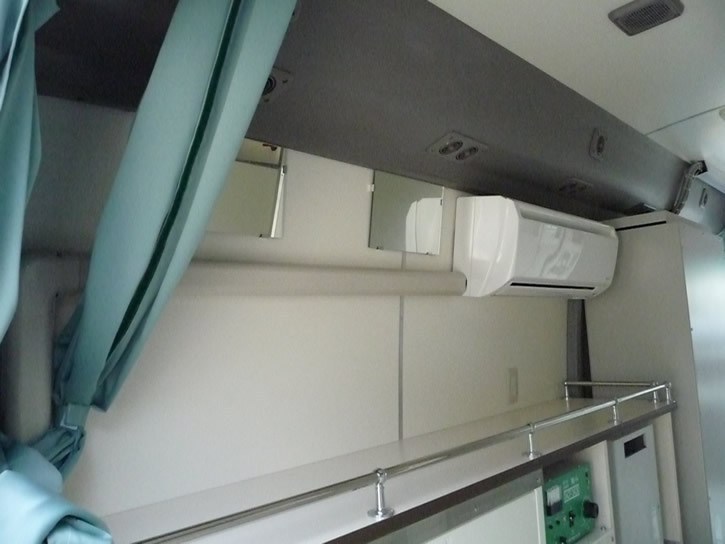 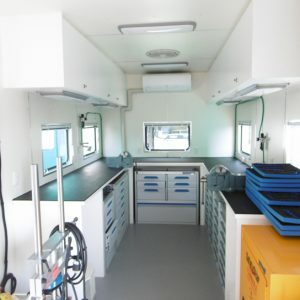 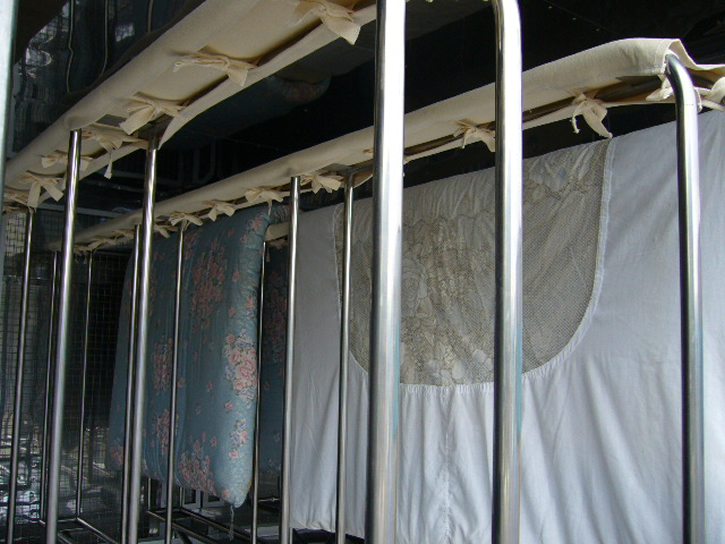 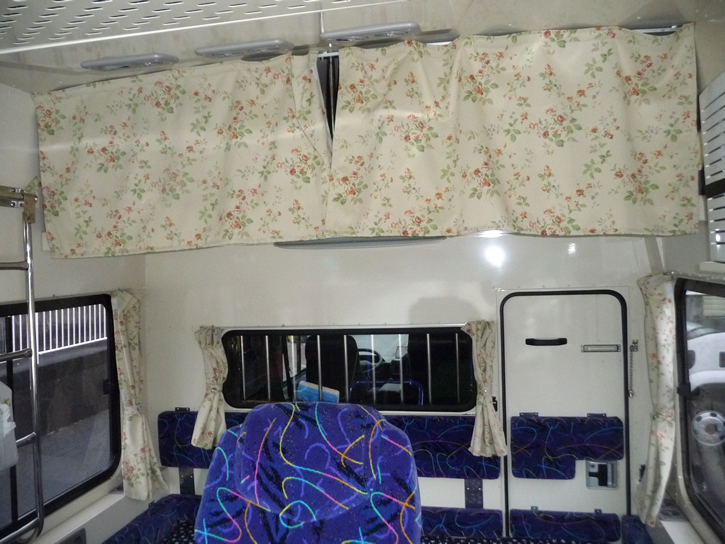 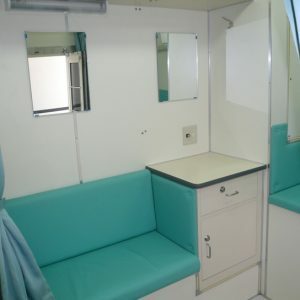 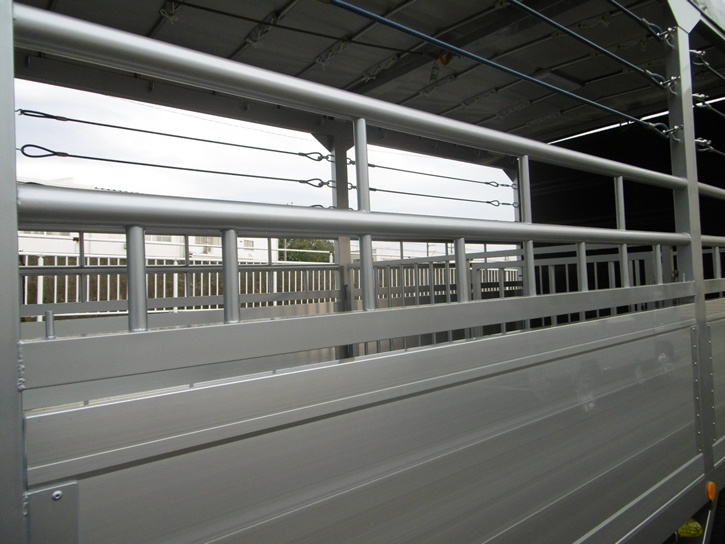 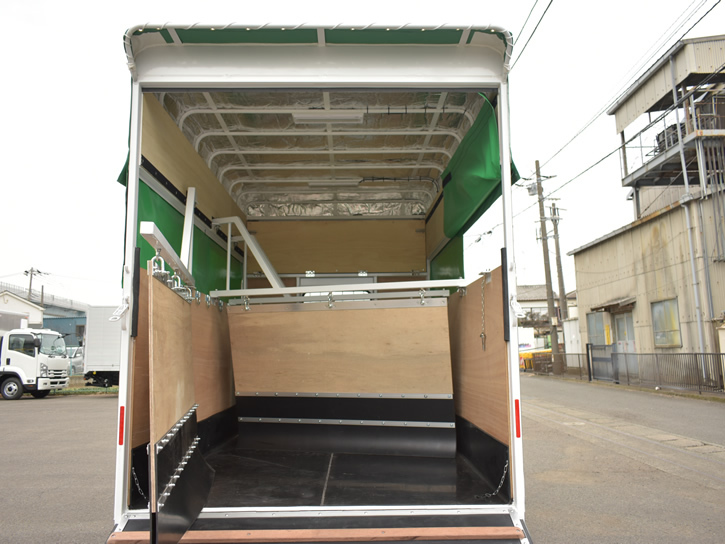 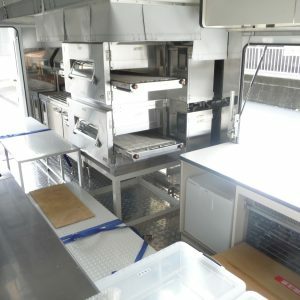 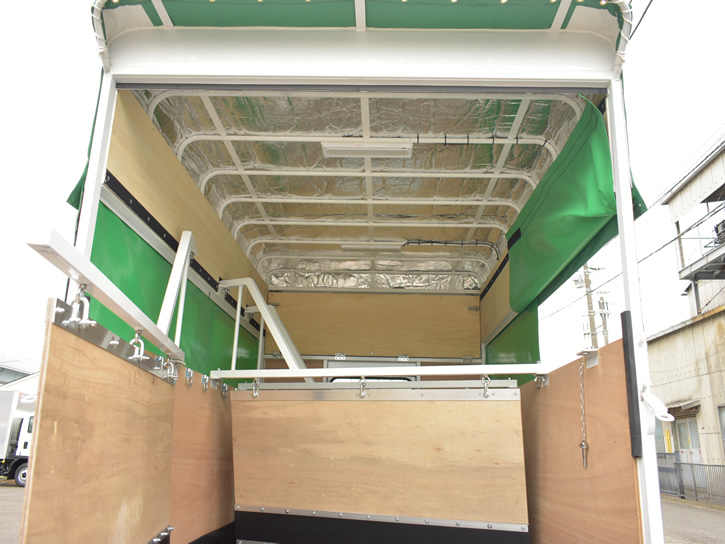 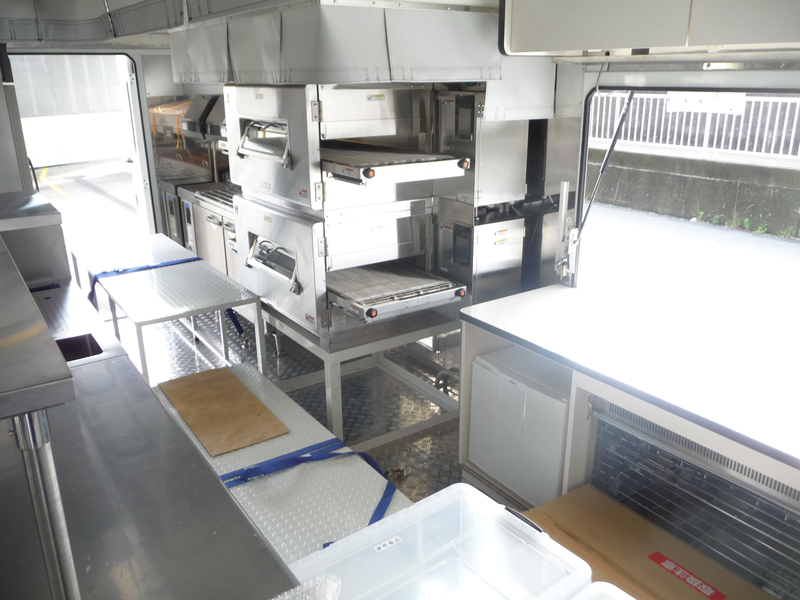 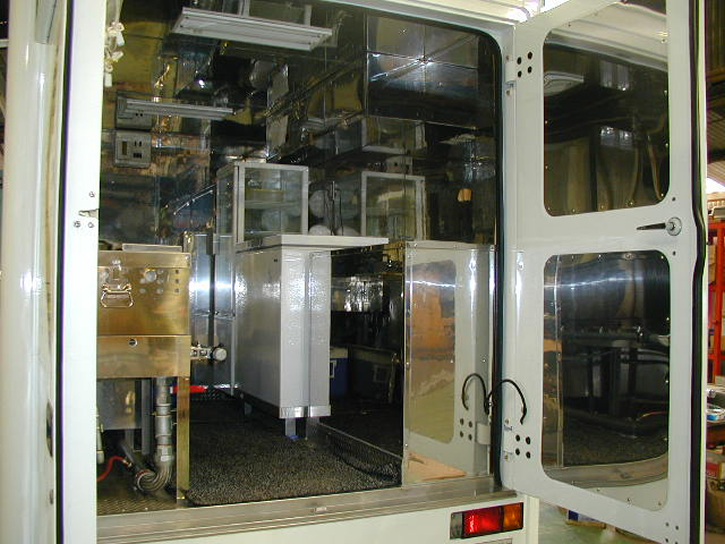 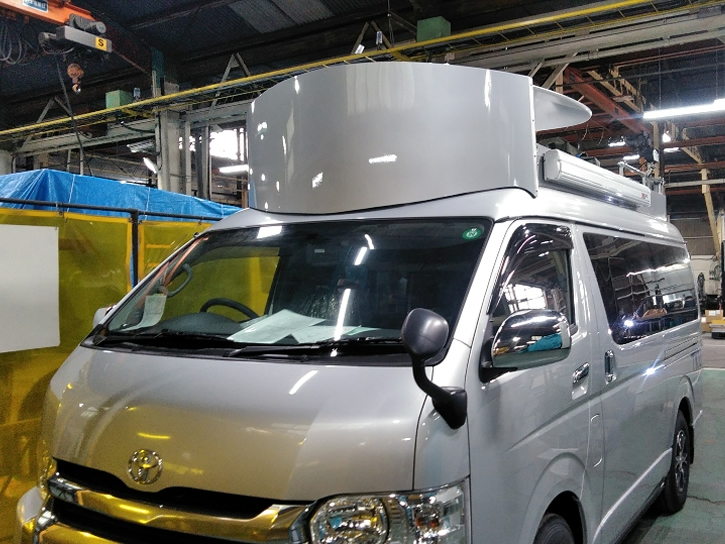 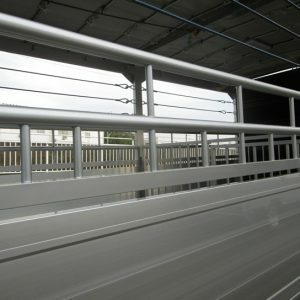 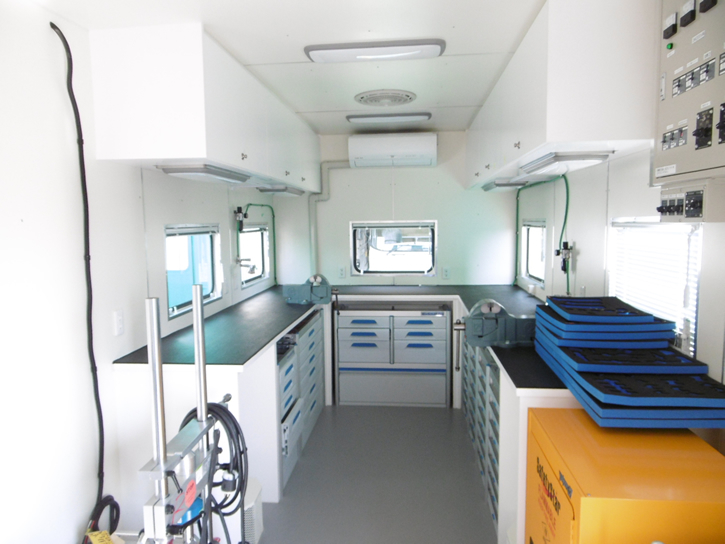 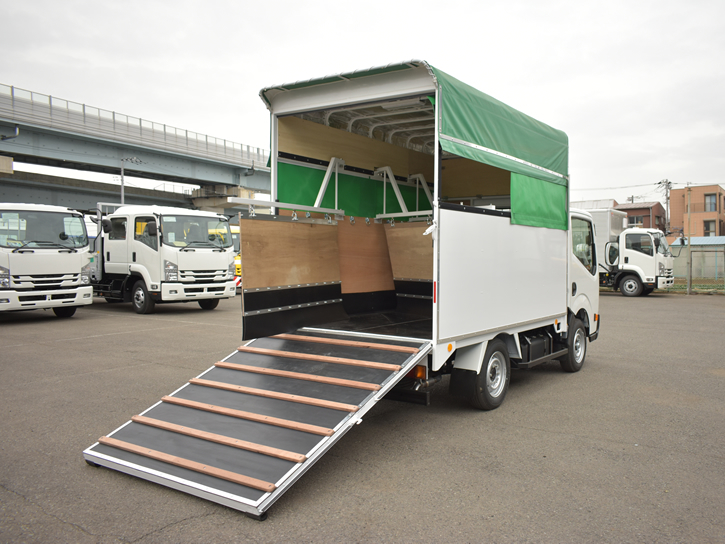 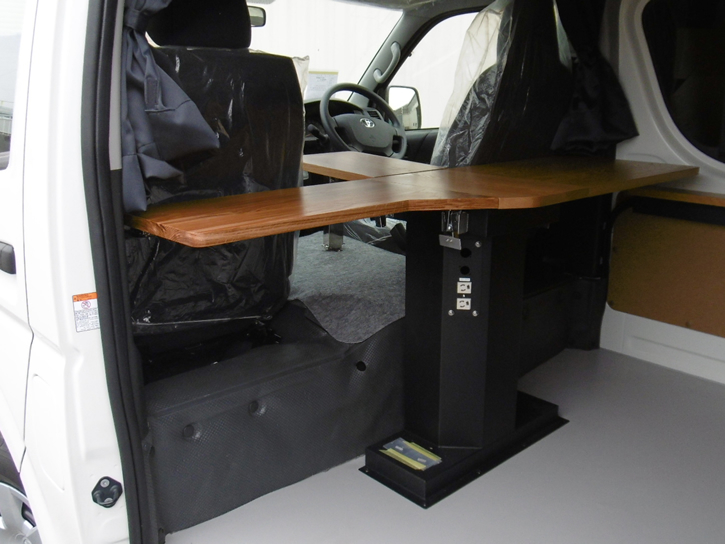 It becomes the production on the track base, and the interior layout is possible at customer’s request. 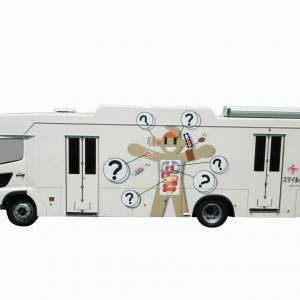 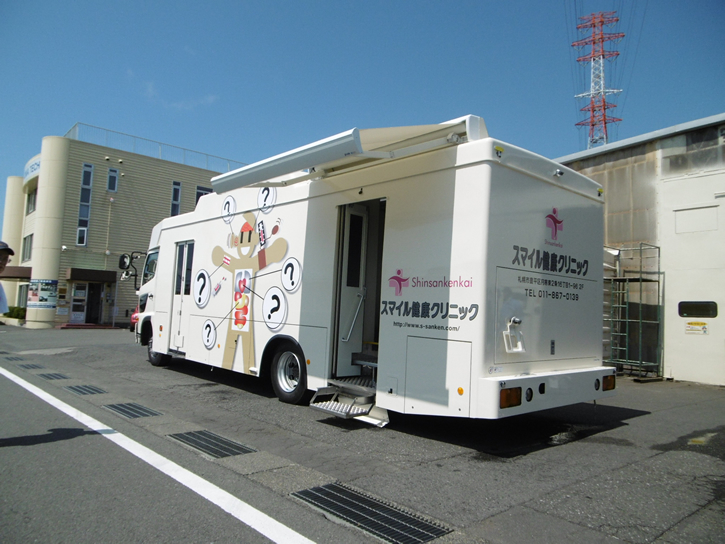 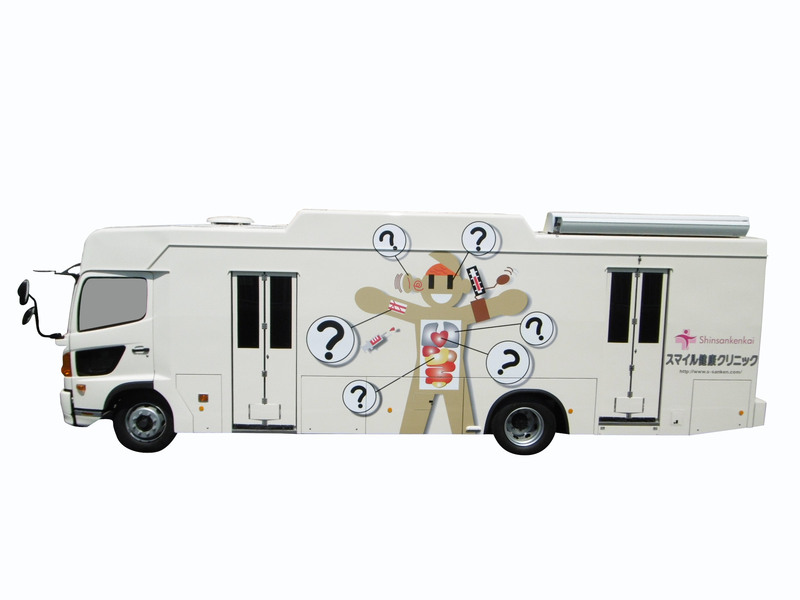 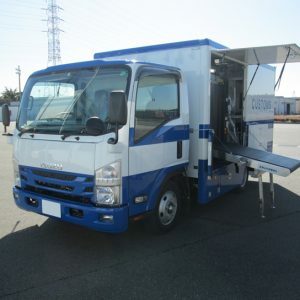 Using large trucks, it is possible to check both the chest and stomach. 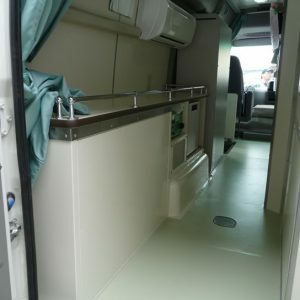 Indoor layout is possible at customer’s request. 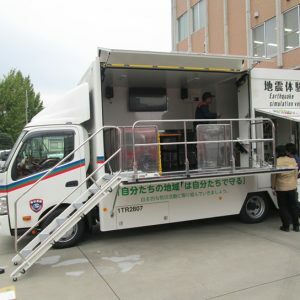 Examination car based on mini bus. 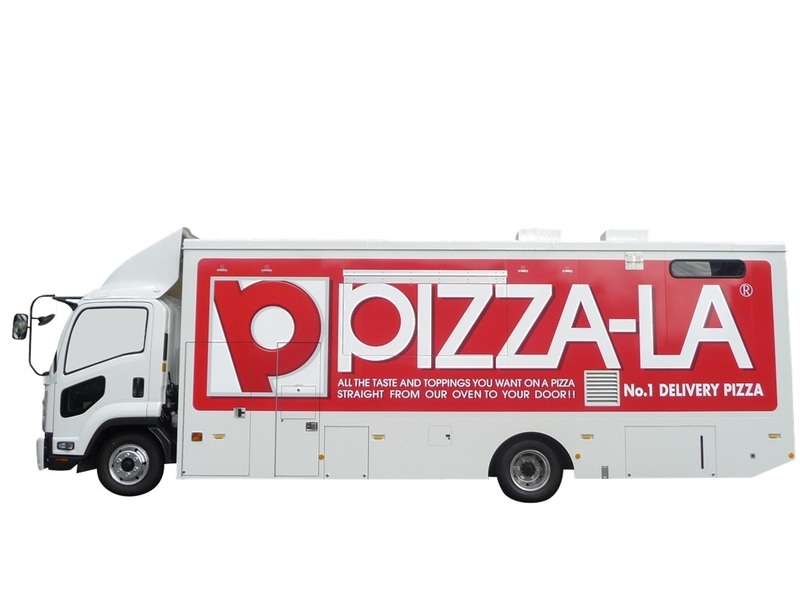 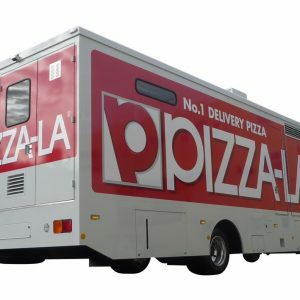 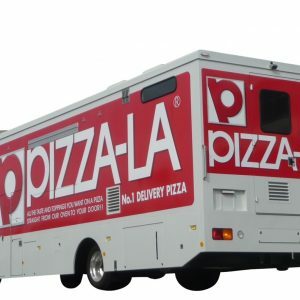 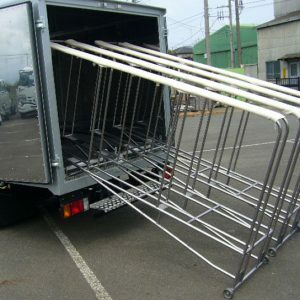 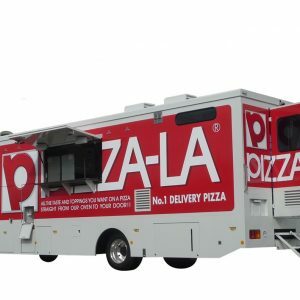 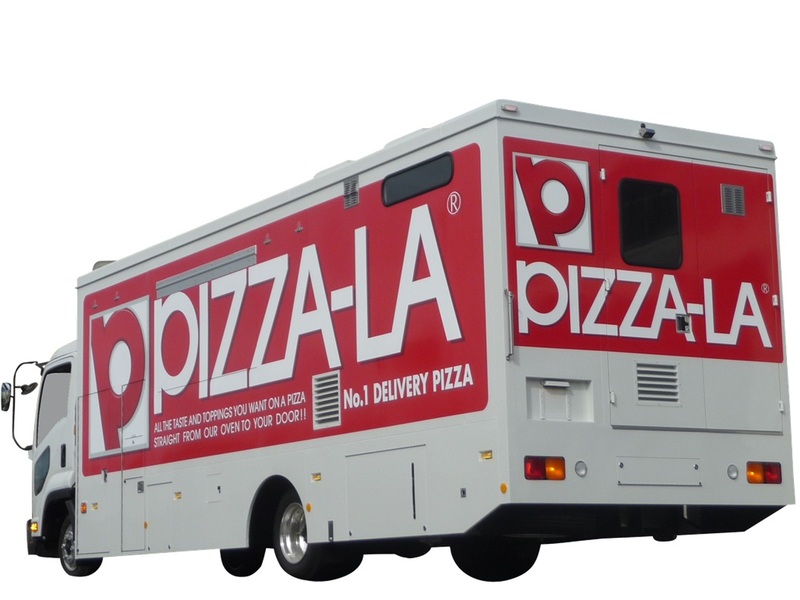 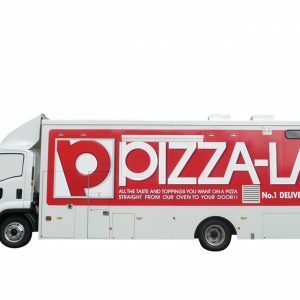 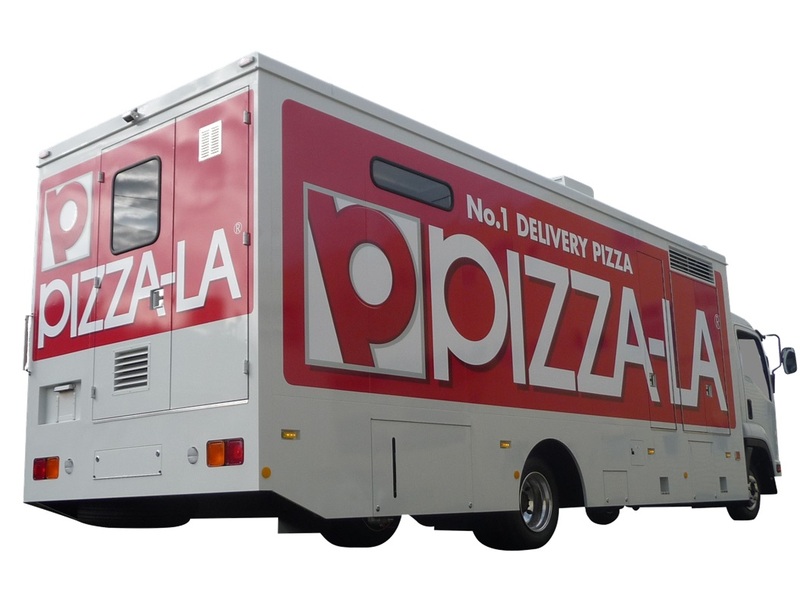 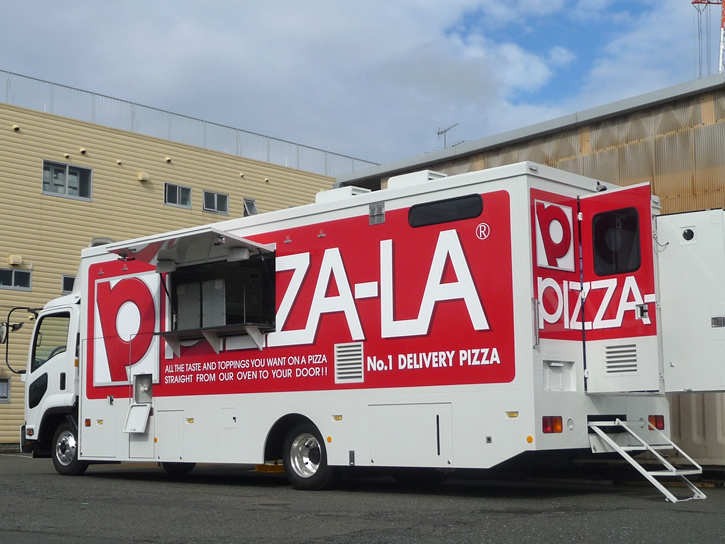 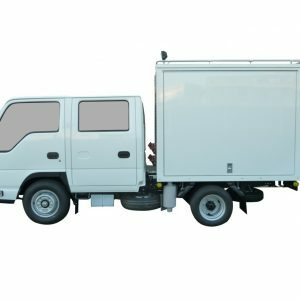 Vehicles that can sell products while moving. 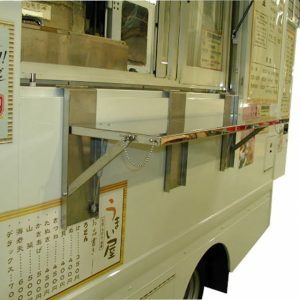 It is also possible to display our products from eating and drinking. 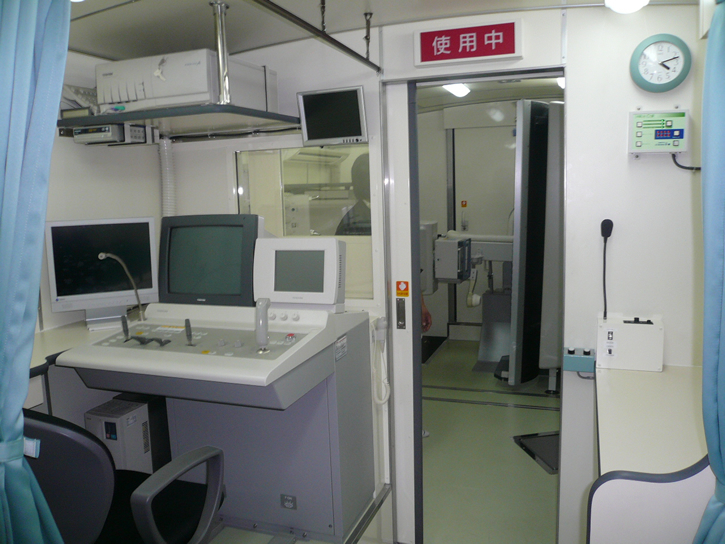 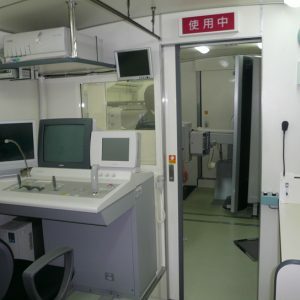 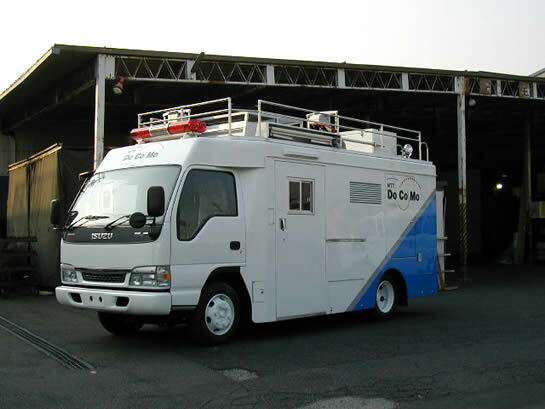 The smallest size SNG relay car. 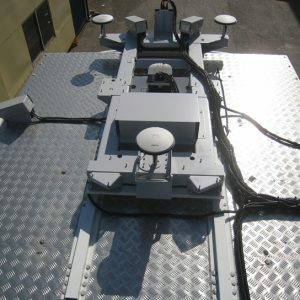 A 1.5 m satellite antenna and a 10 m high electric expansion pole and 4 electric jacks are installed. 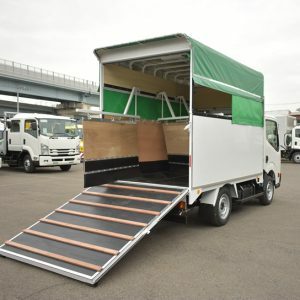 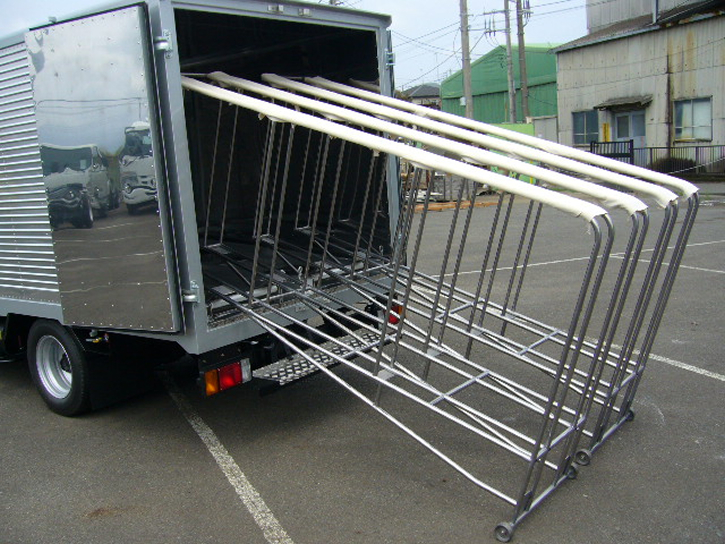 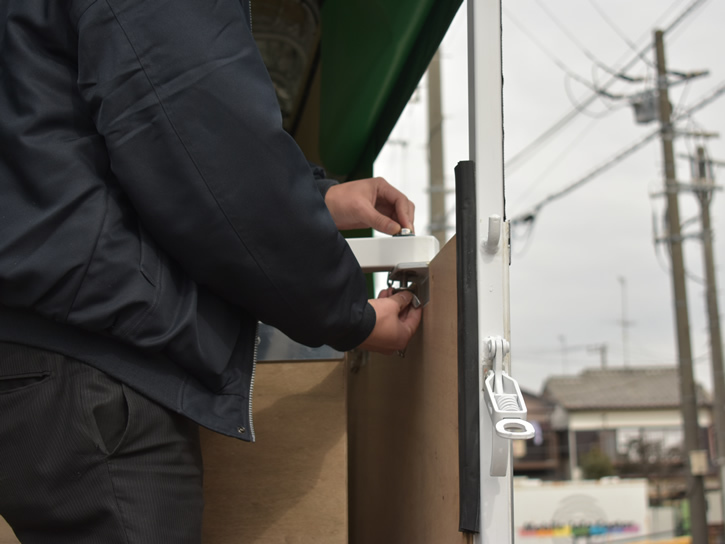 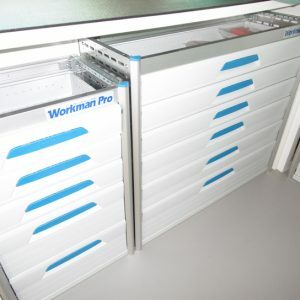 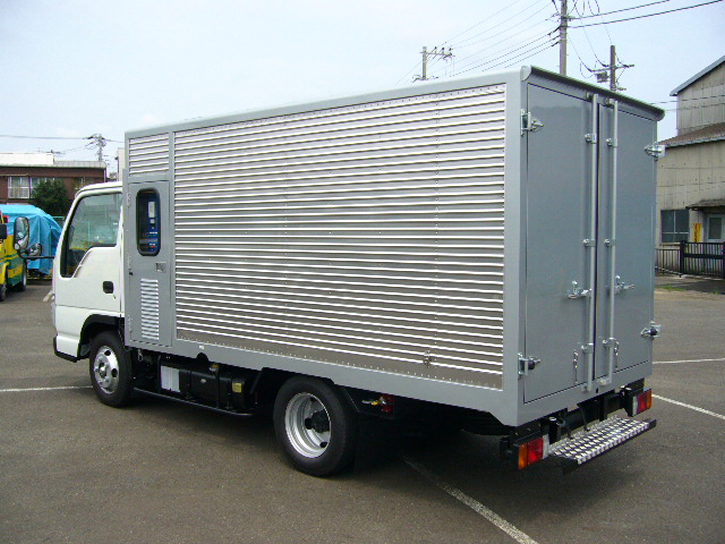 It can be manufactured on a small truck, one box base. 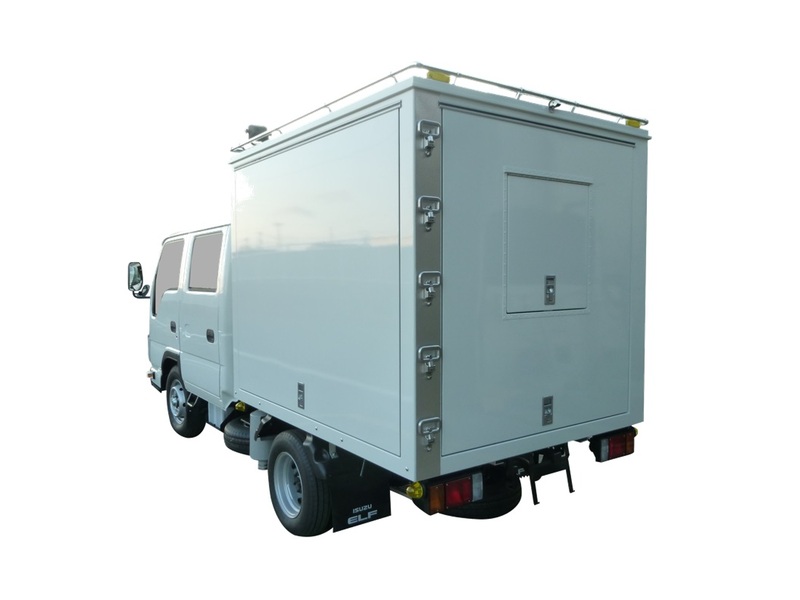 The smallest size SNG relay car. 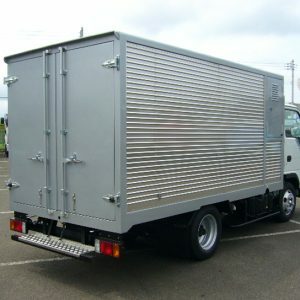 It can be manufactured on a small truck, one box base. 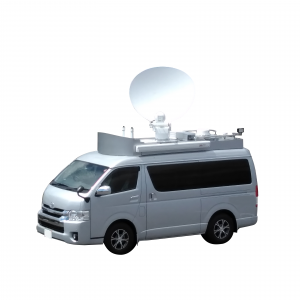 It is a vehicle to interview and relay TV. 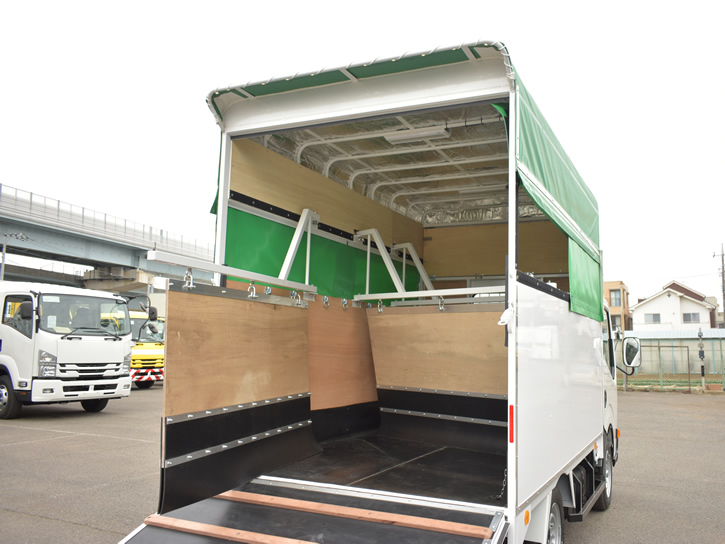 It is not a rare track in a relay car but based on a land cruiser of a passenger car. 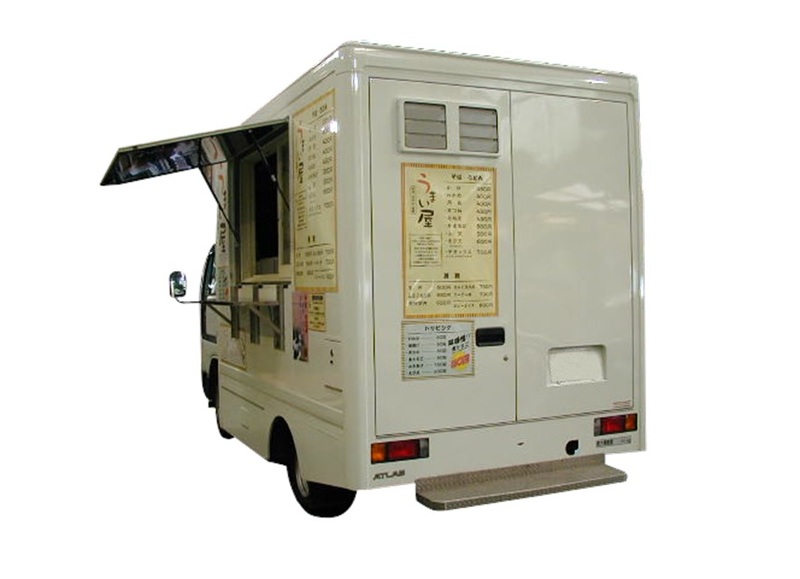 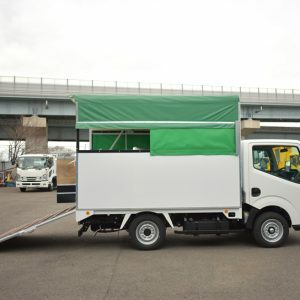 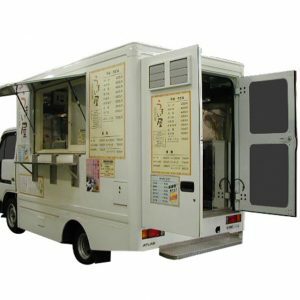 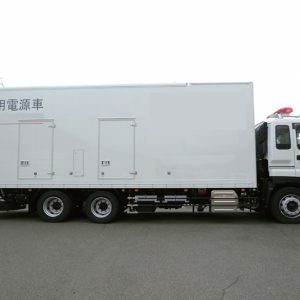 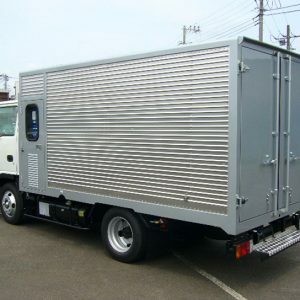 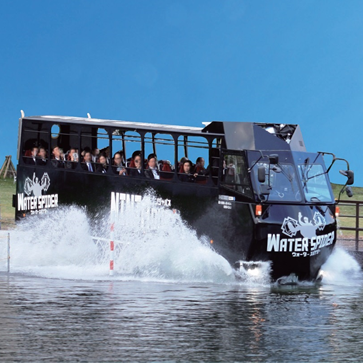 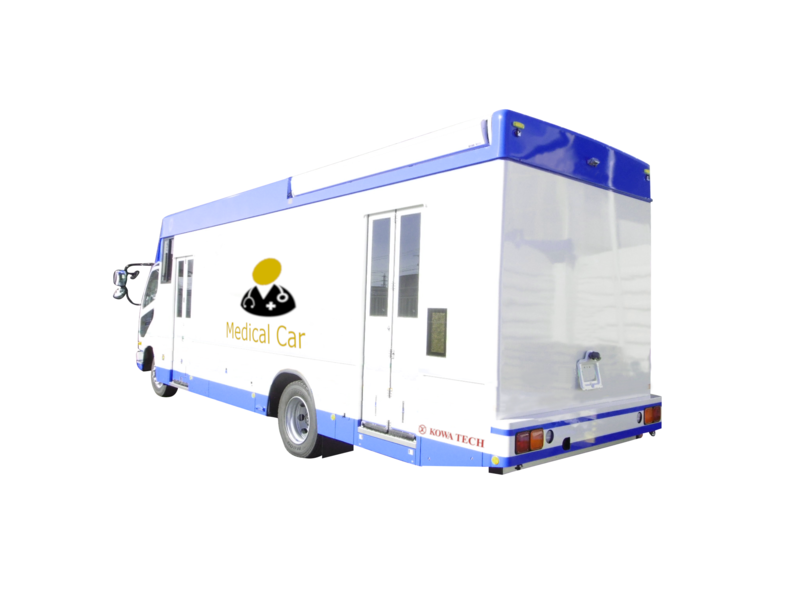 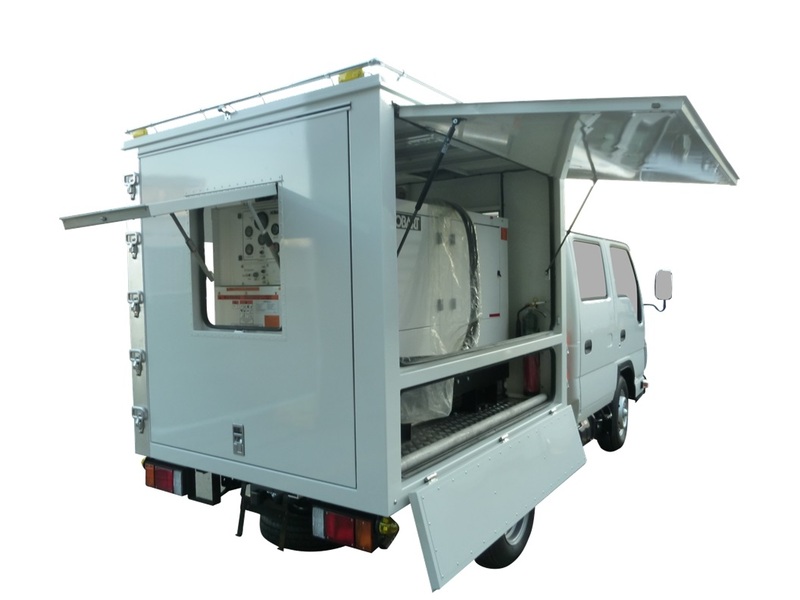 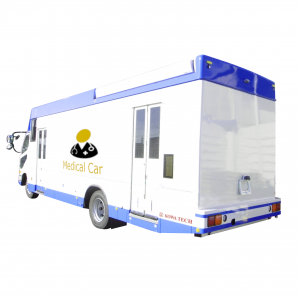 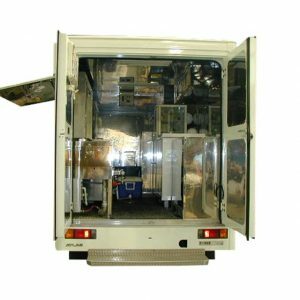 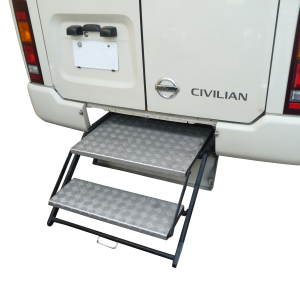 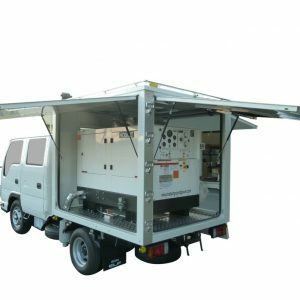 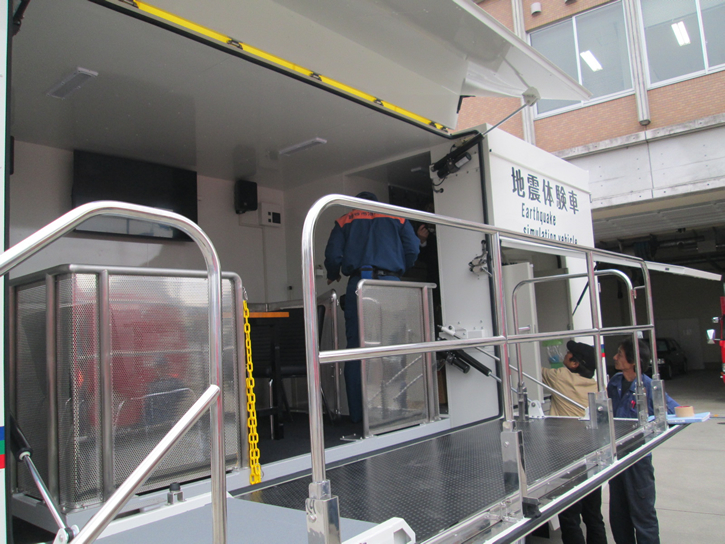 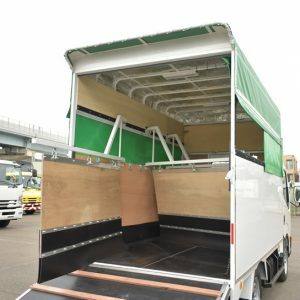 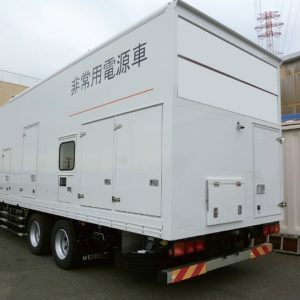 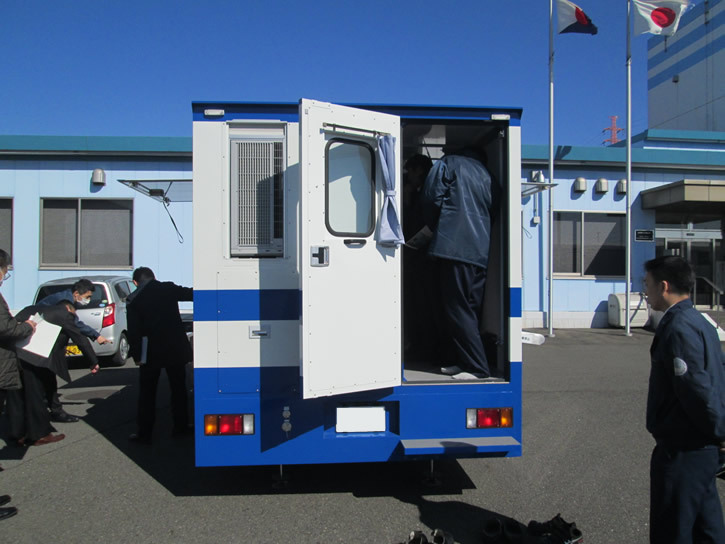 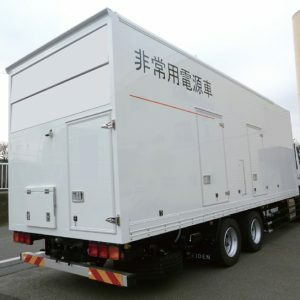 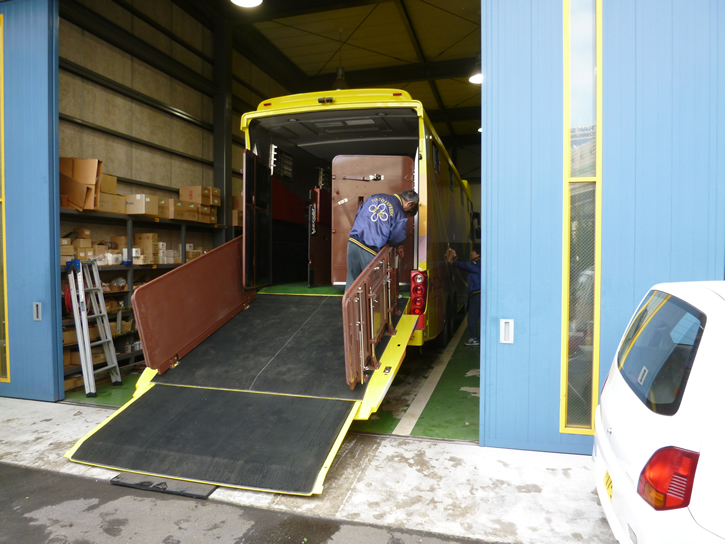 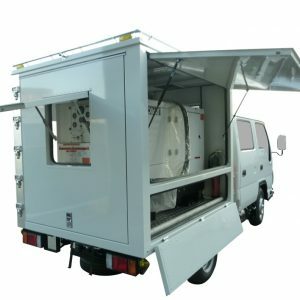 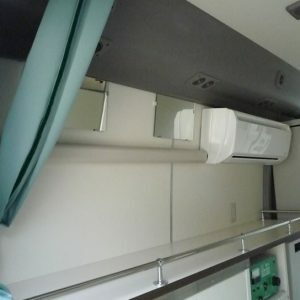 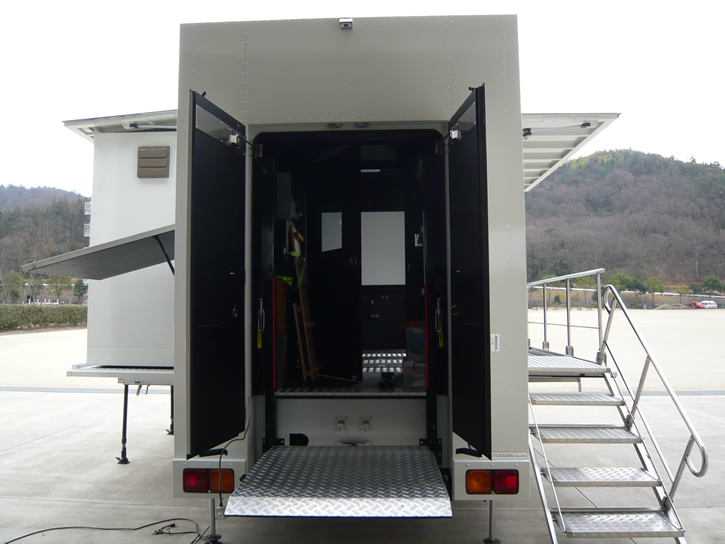 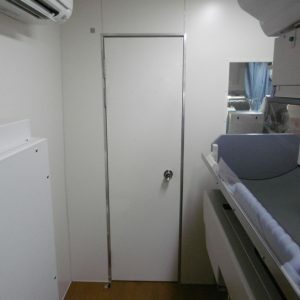 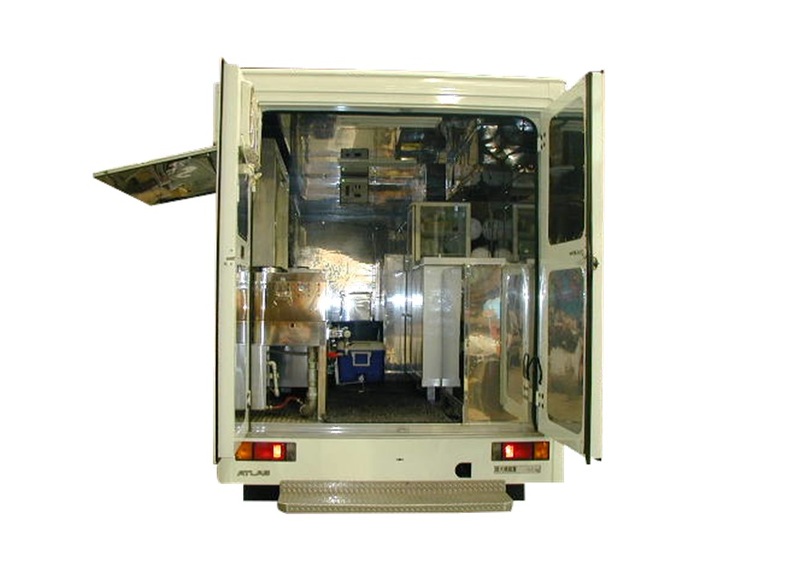 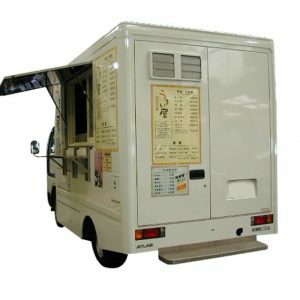 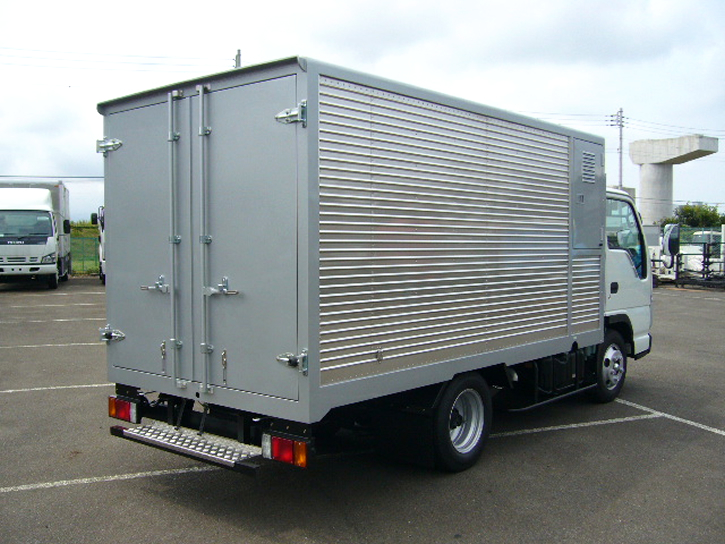 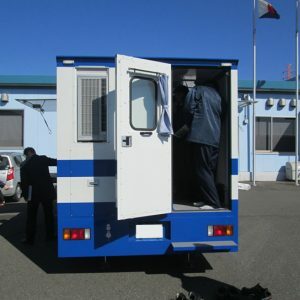 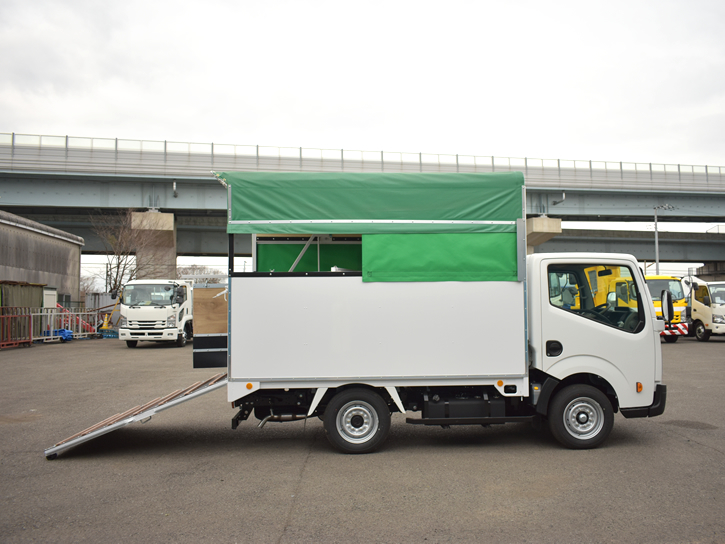 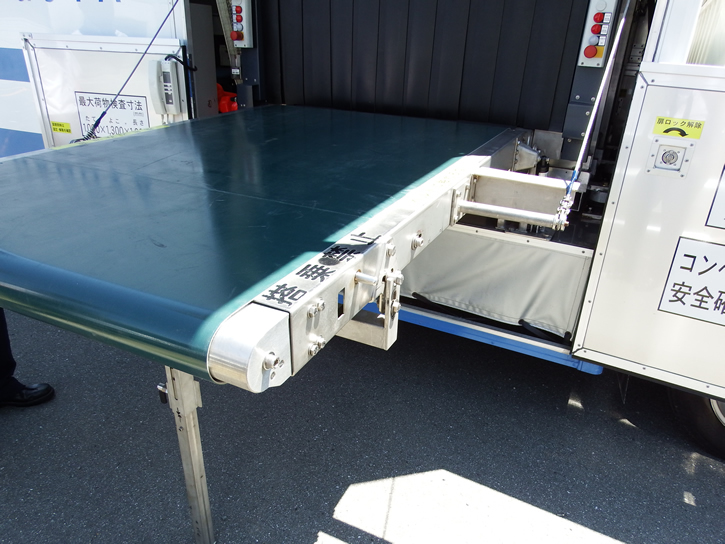 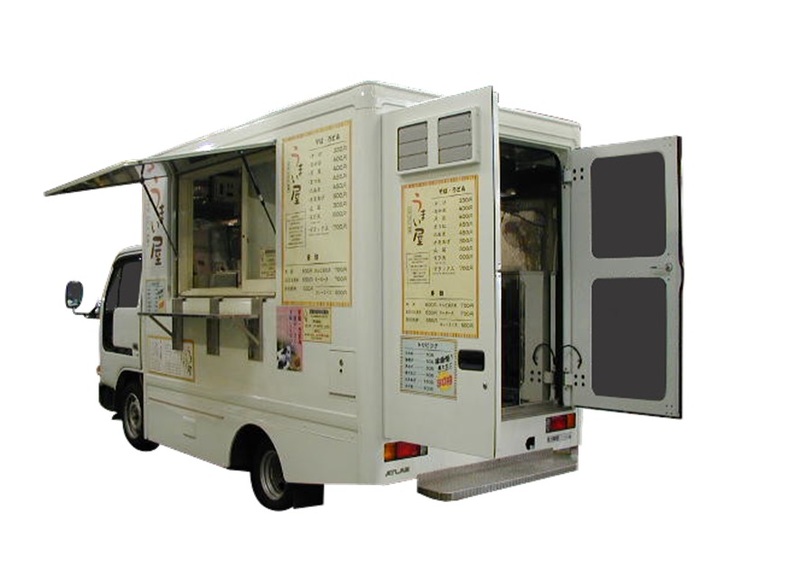 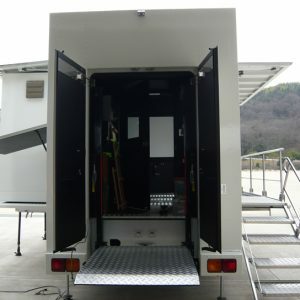 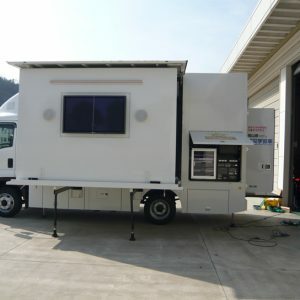 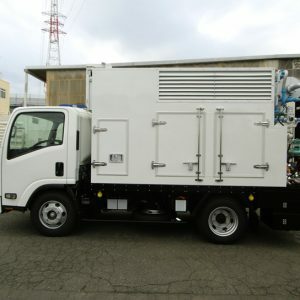 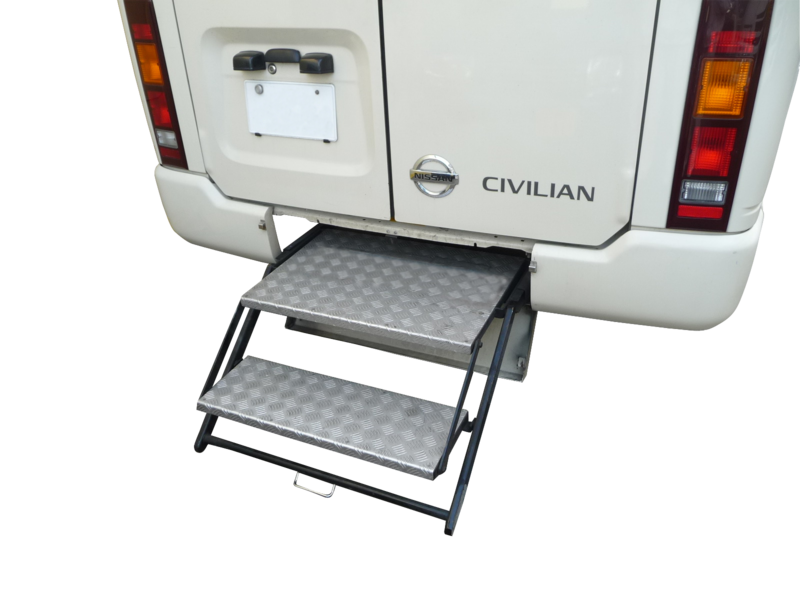 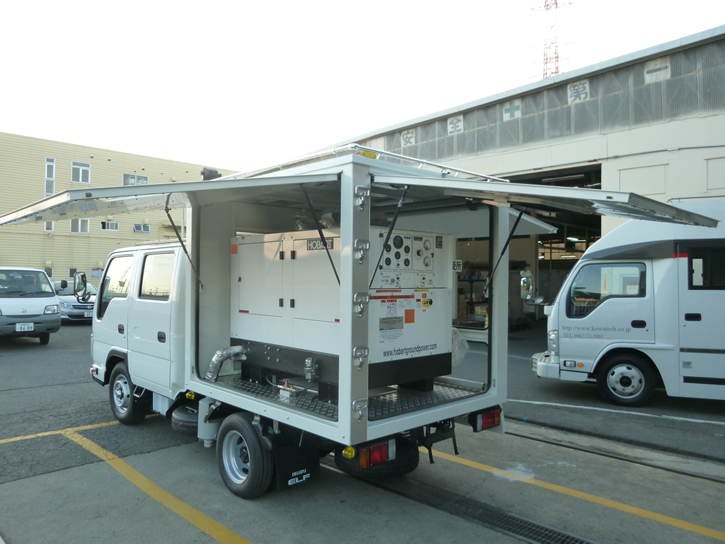 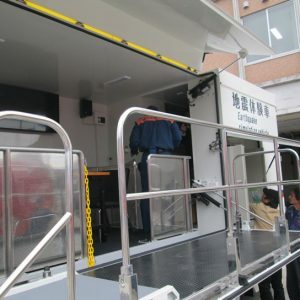 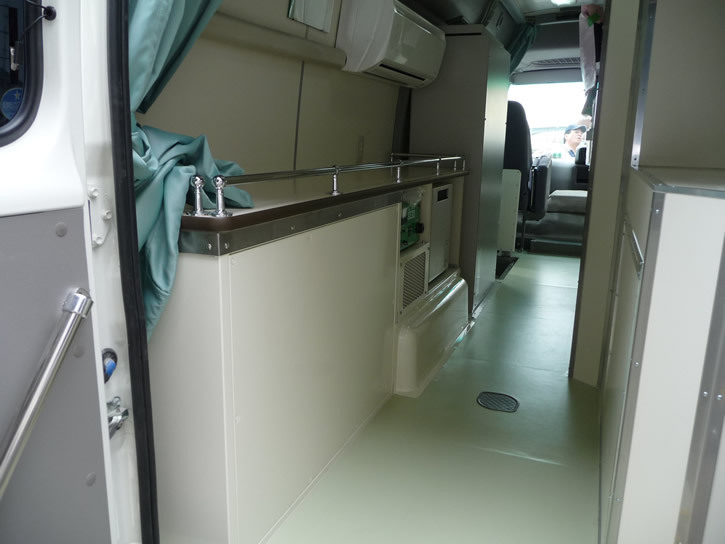 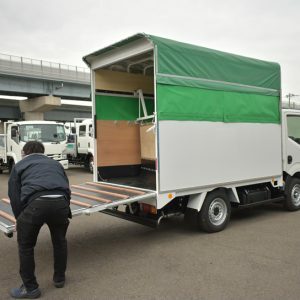 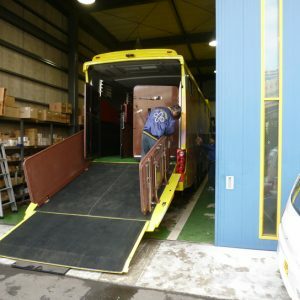 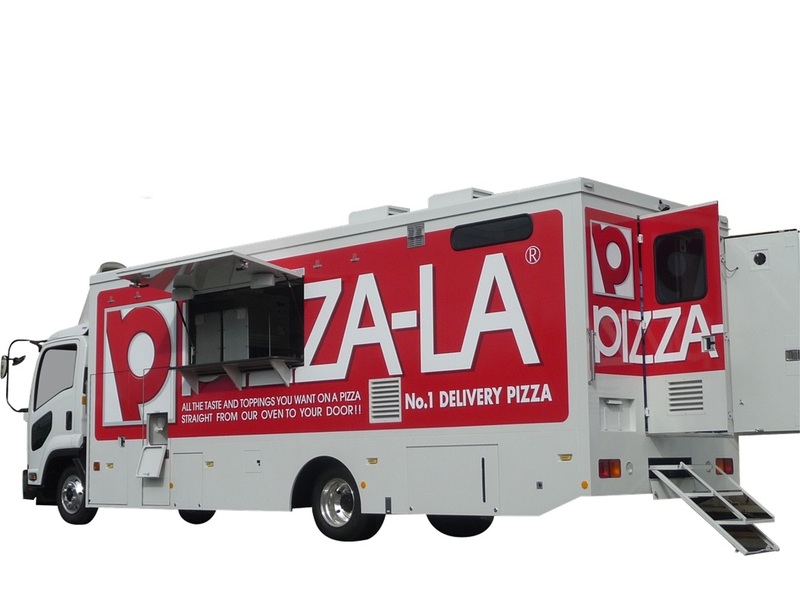 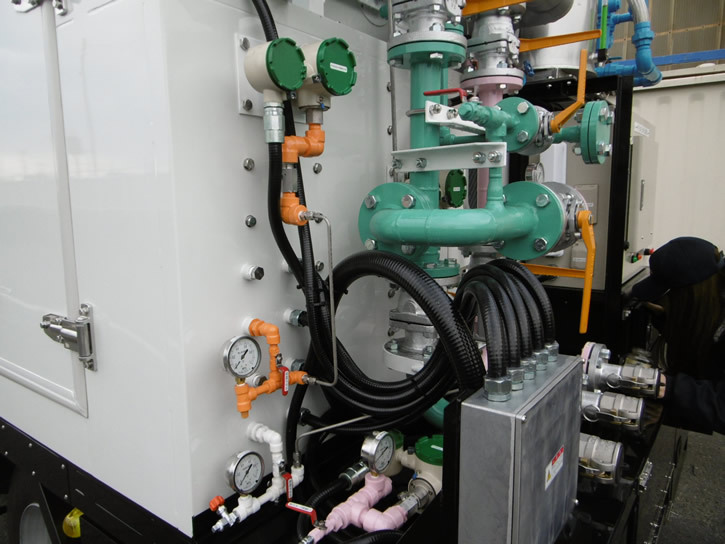 Equipped with 12 M hydraulic pole, a generator is provided under the floor, and the spare tire is transferred to the rear face. 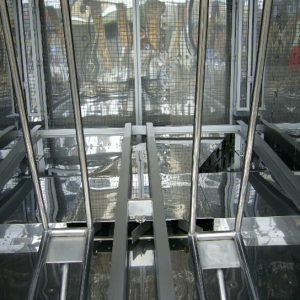 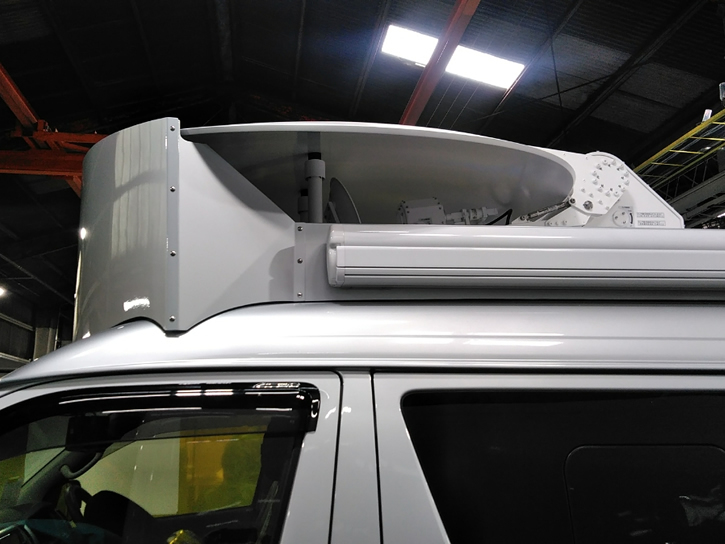 In addition, a ceiling deck has a BOX that can store a parabolic antenna. 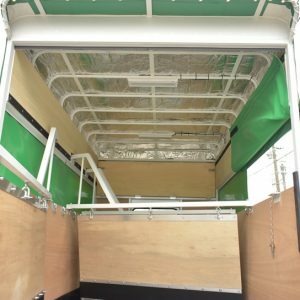 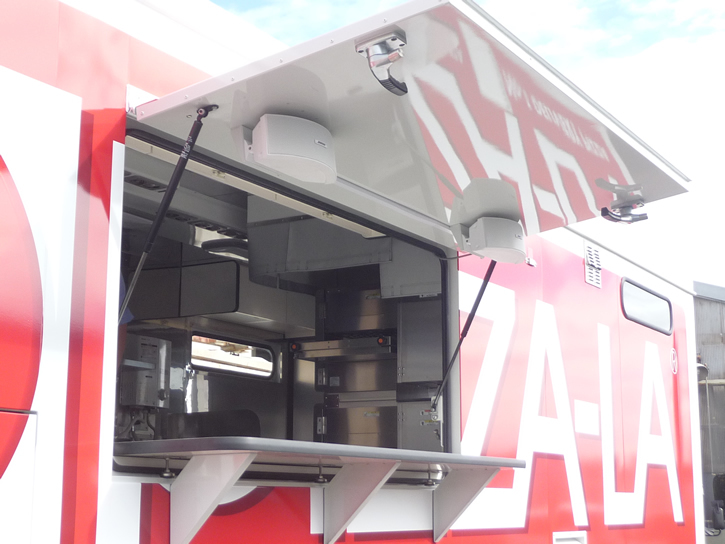 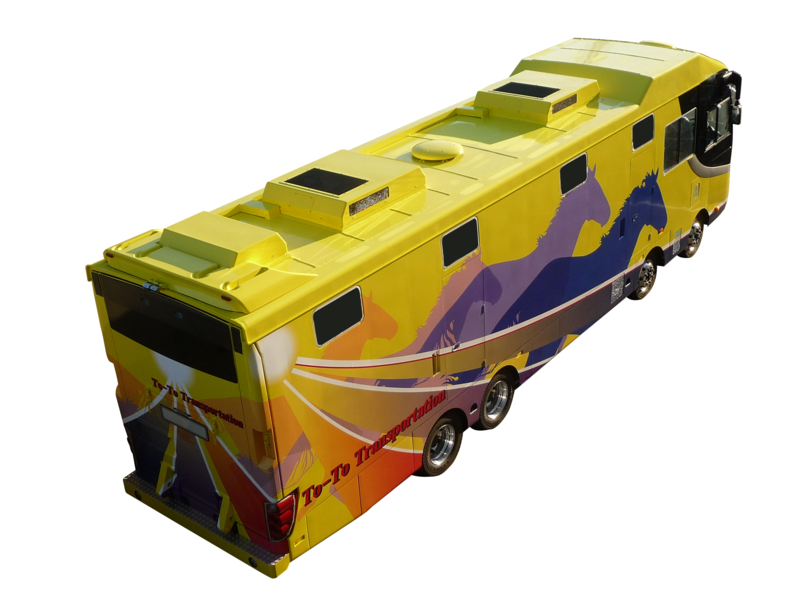 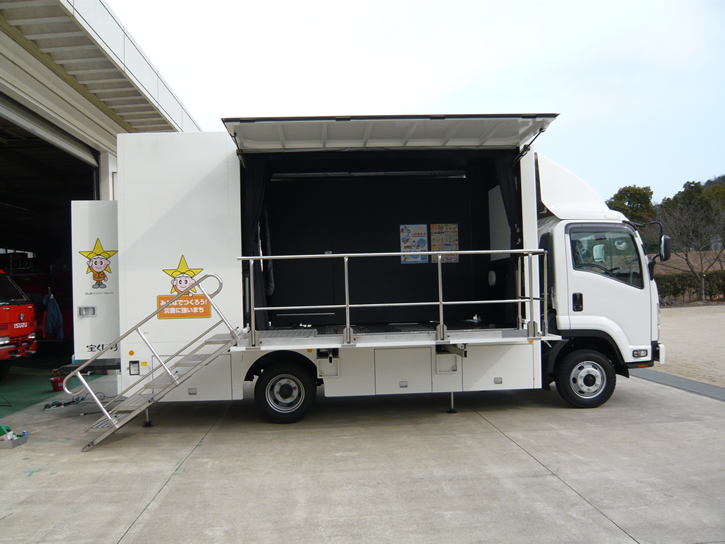 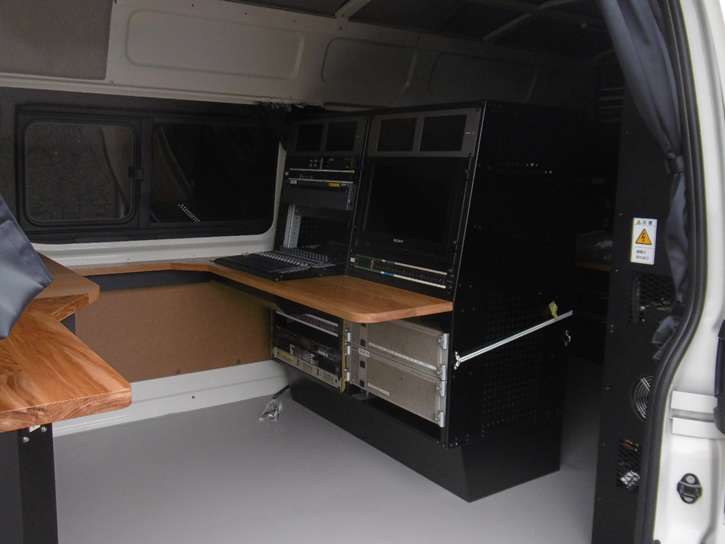 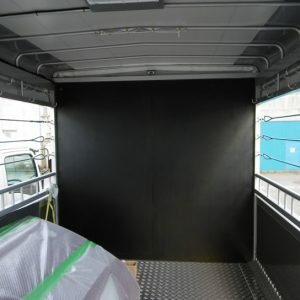 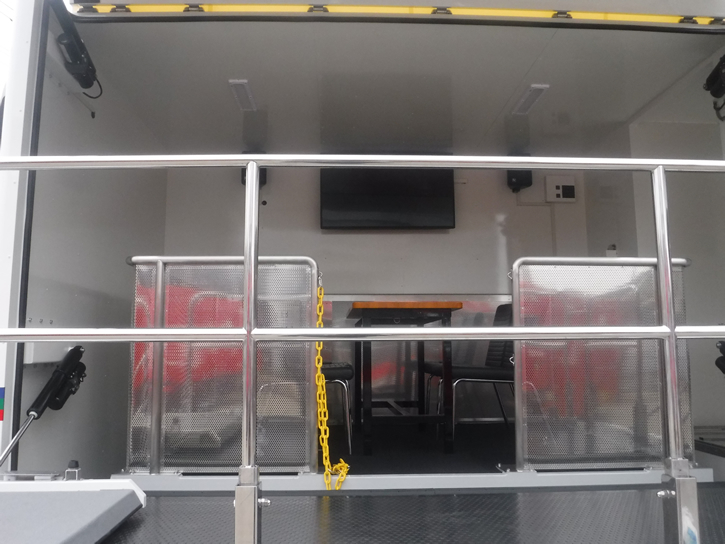 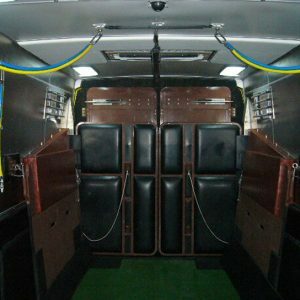 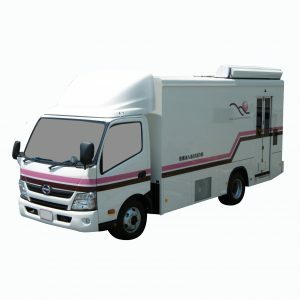 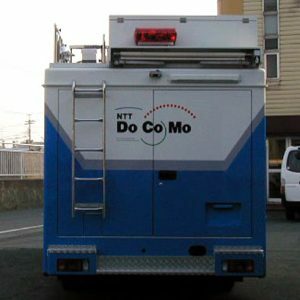 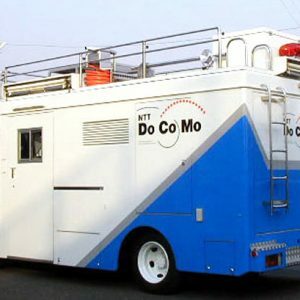 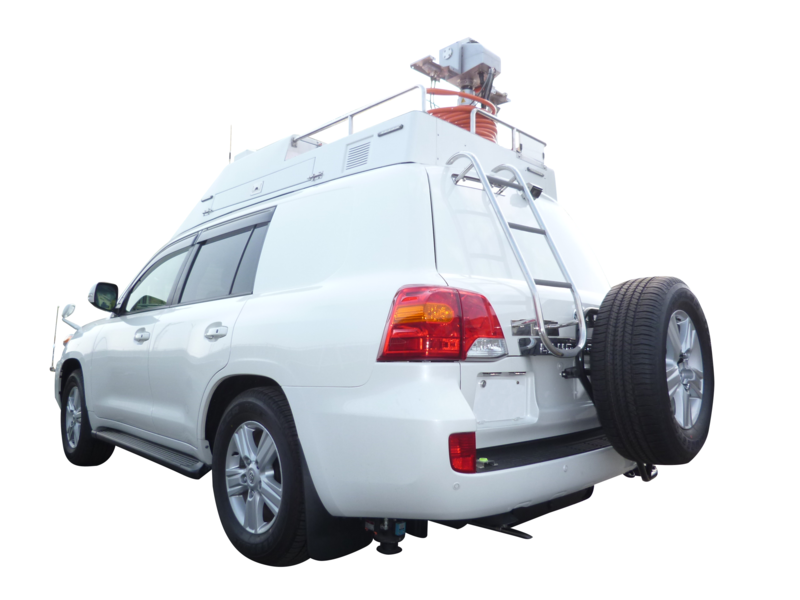 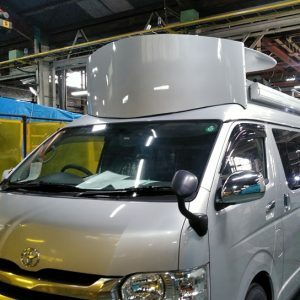 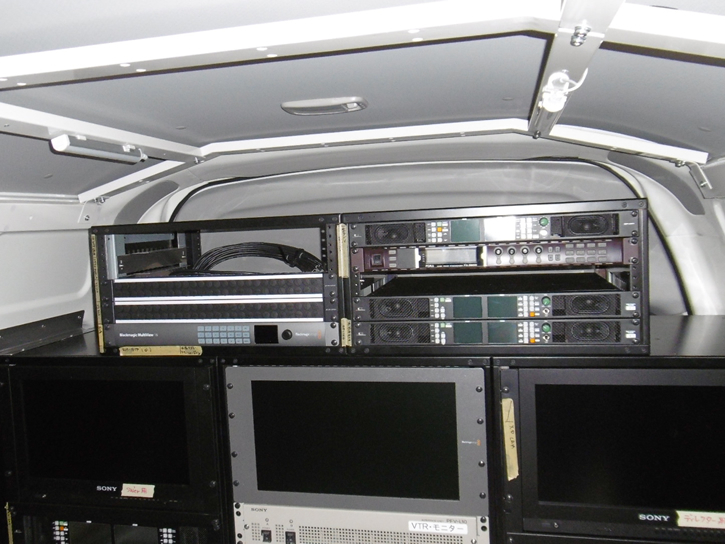 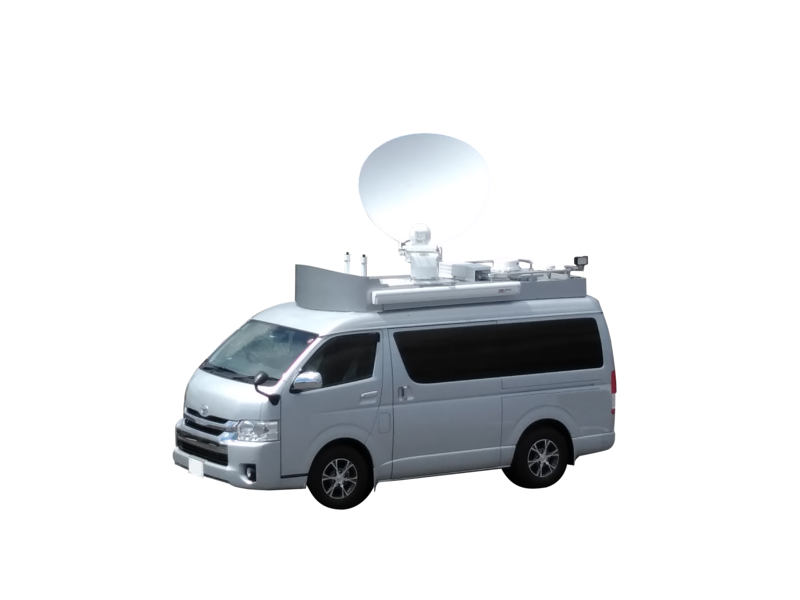 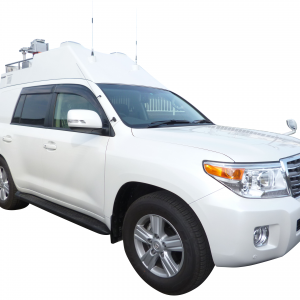 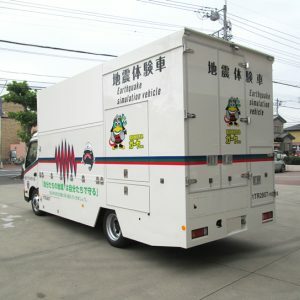 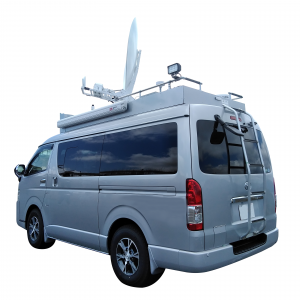 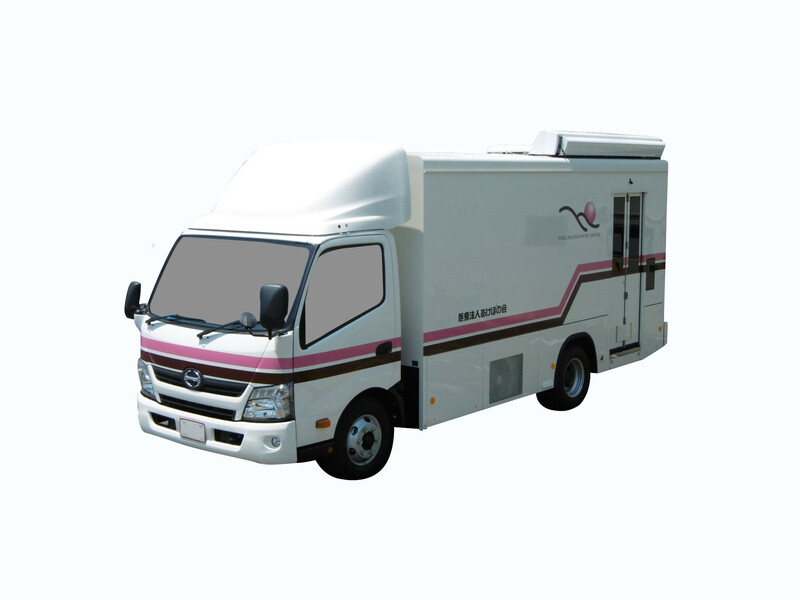 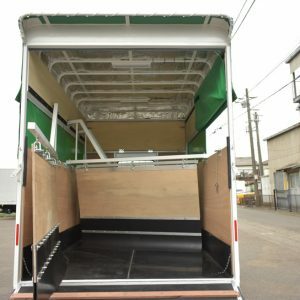 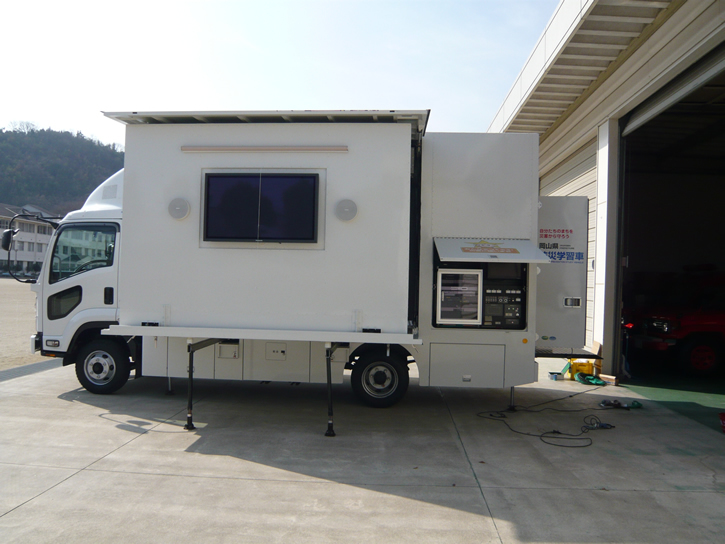 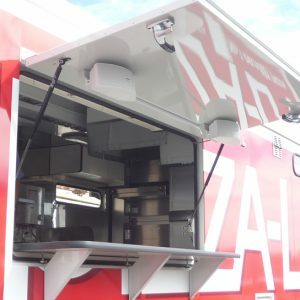 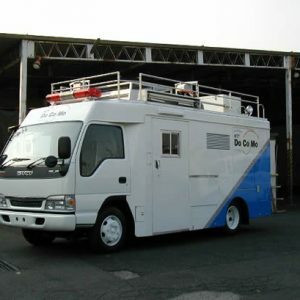 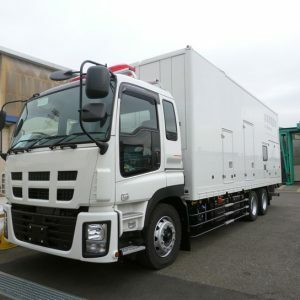 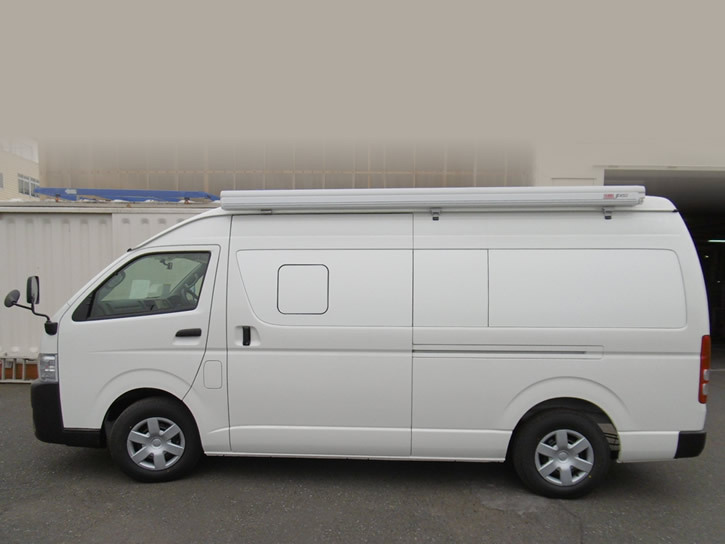 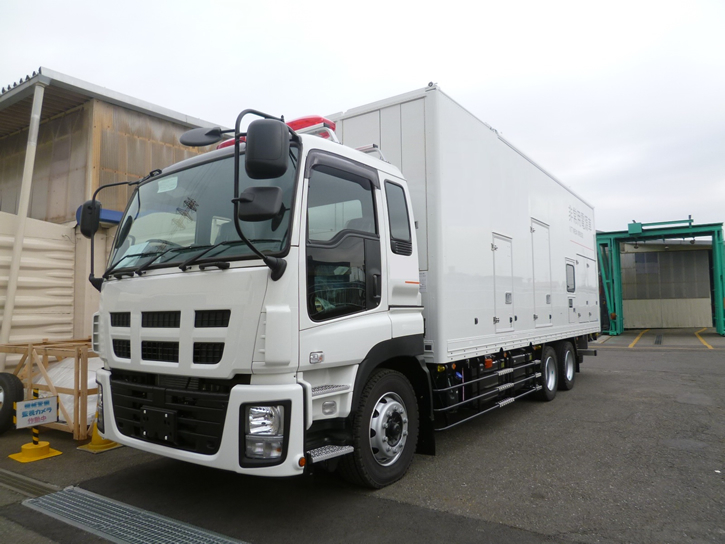 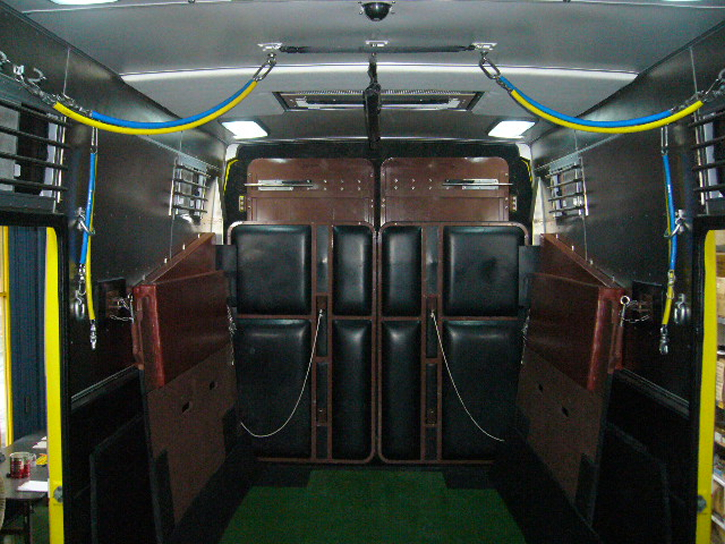 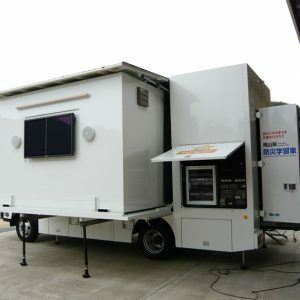 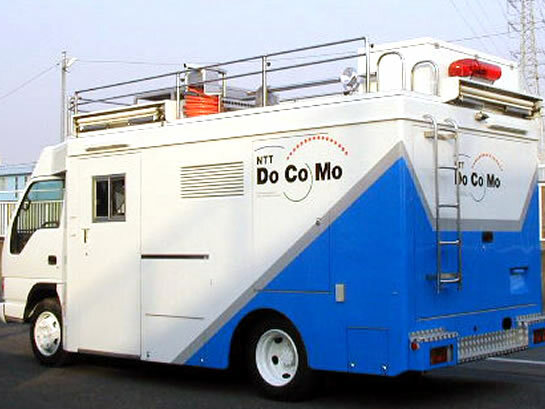 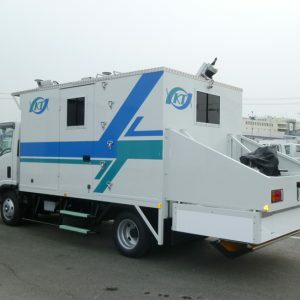 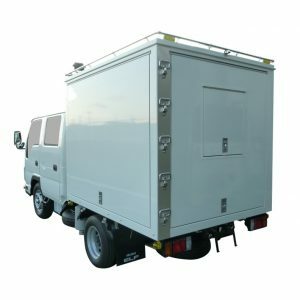 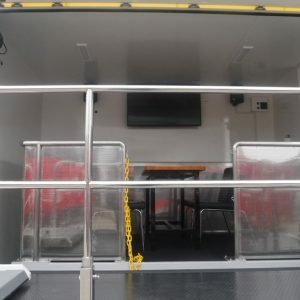 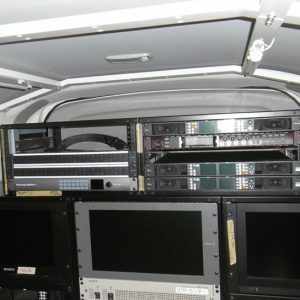 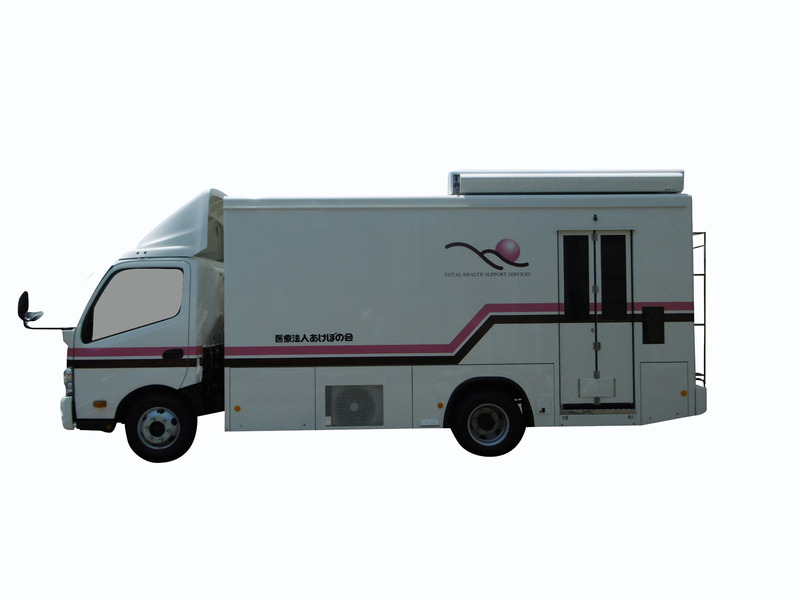 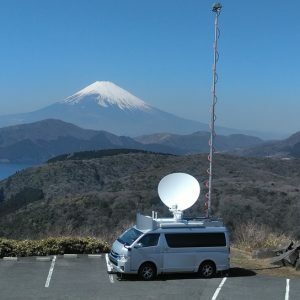 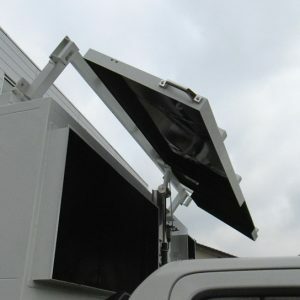 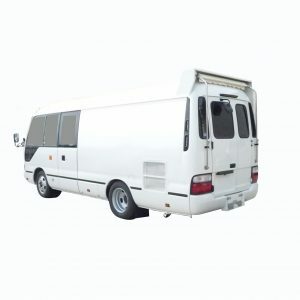 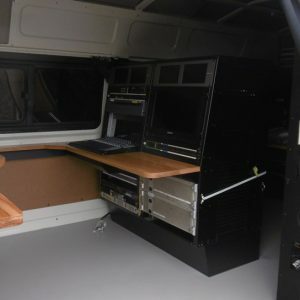 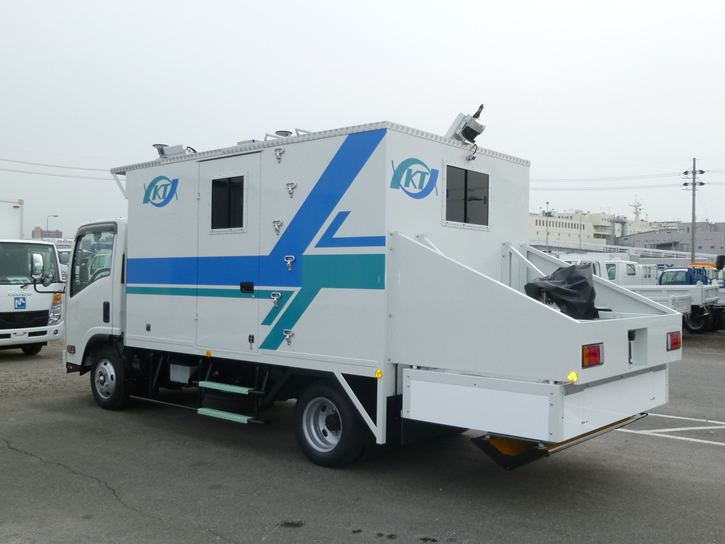 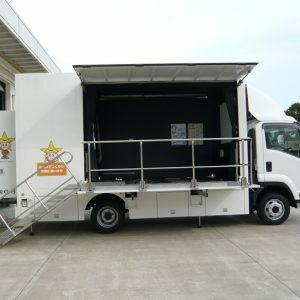 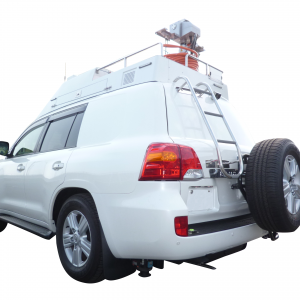 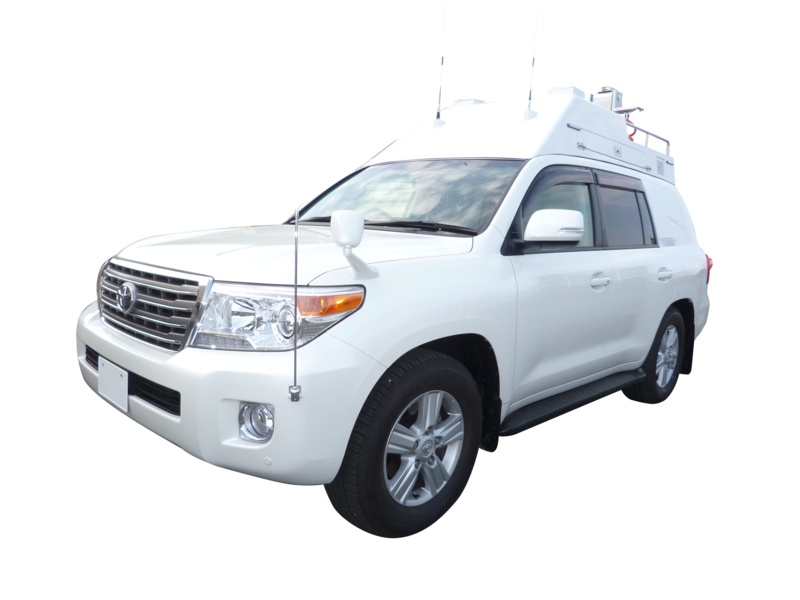 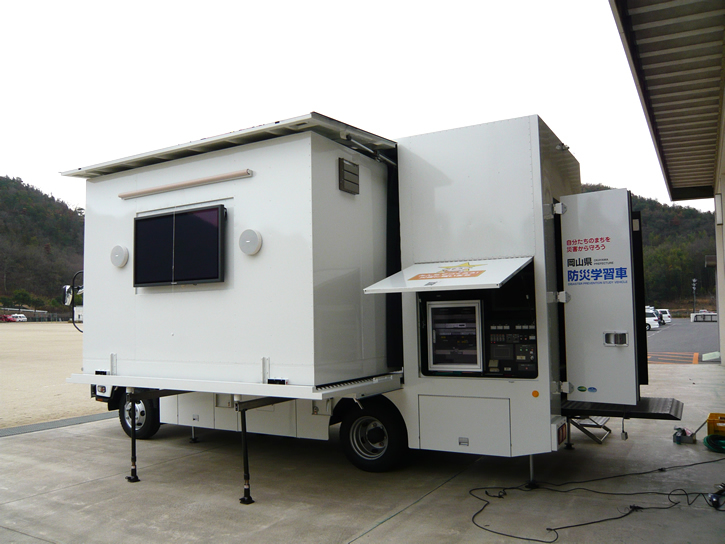 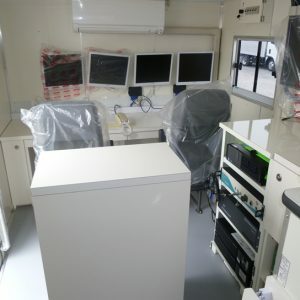 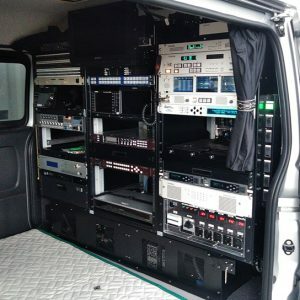 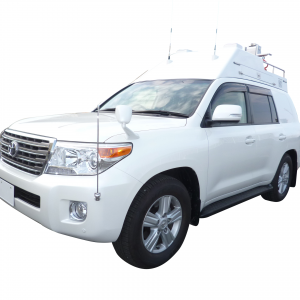 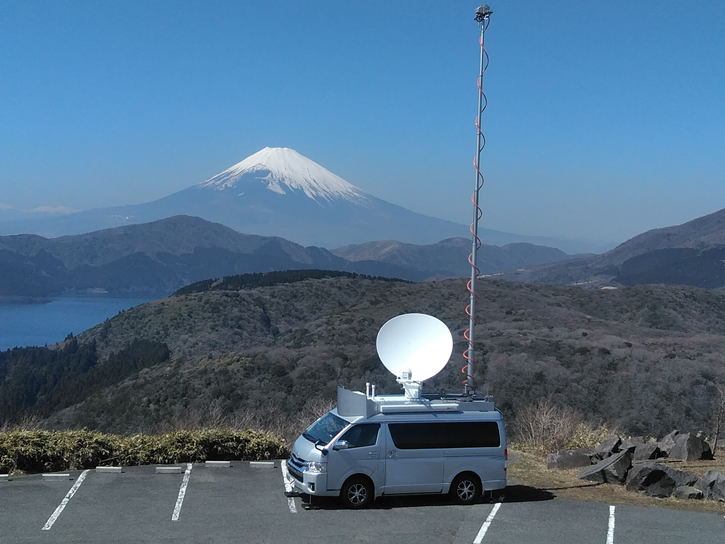 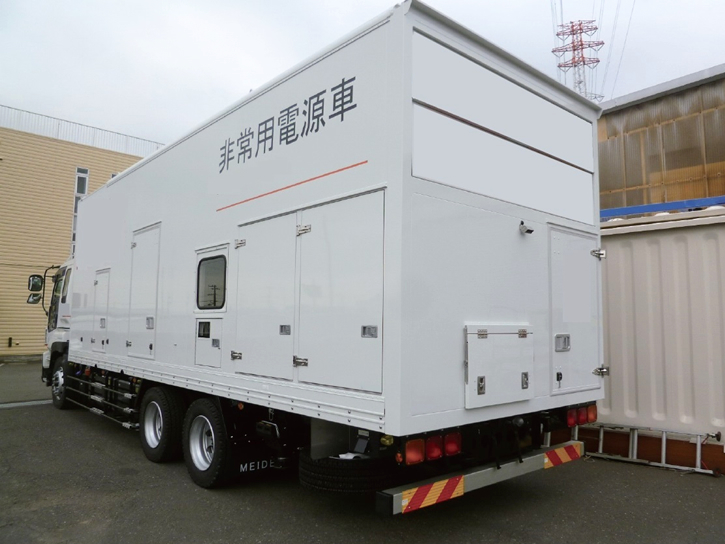 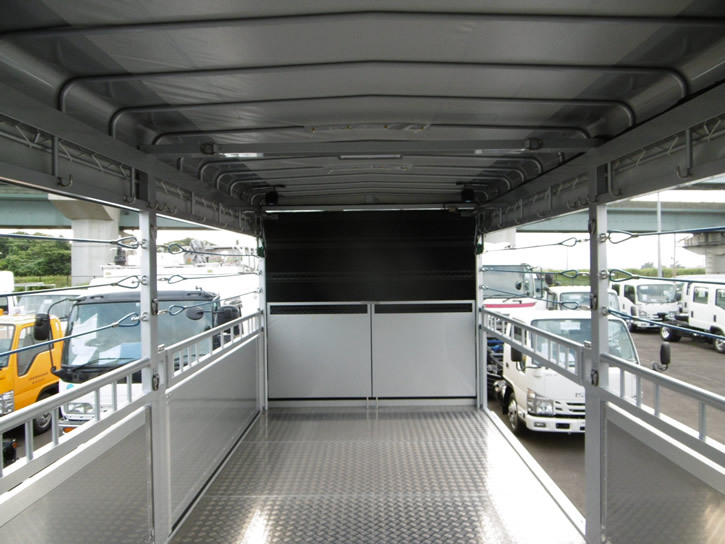 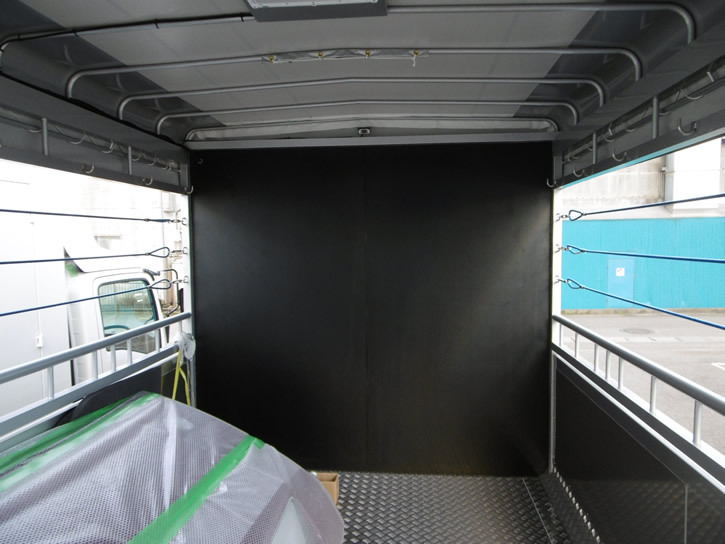 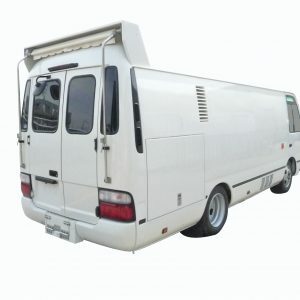 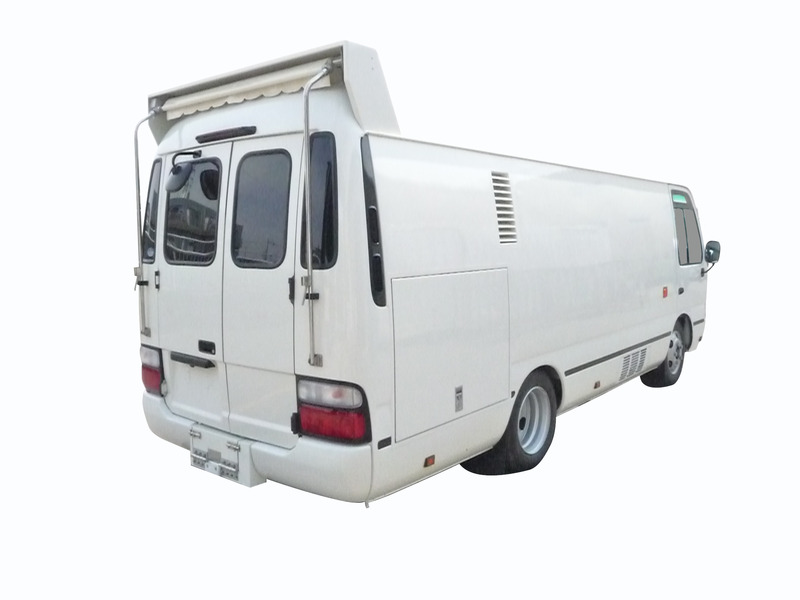 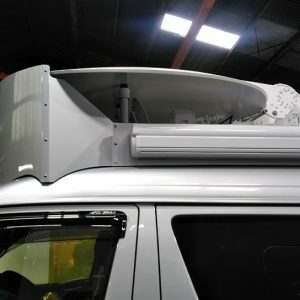 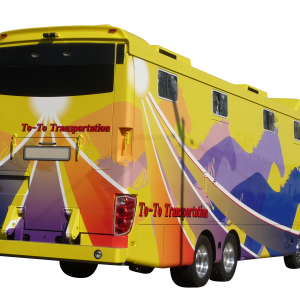 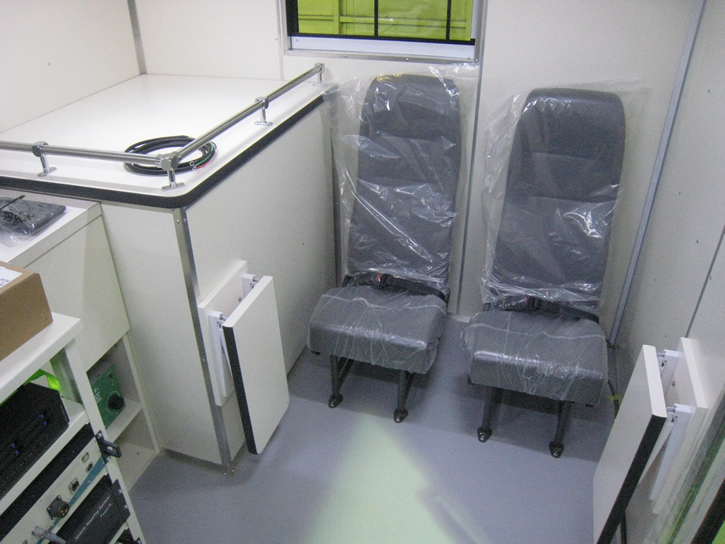 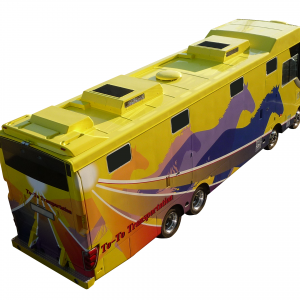 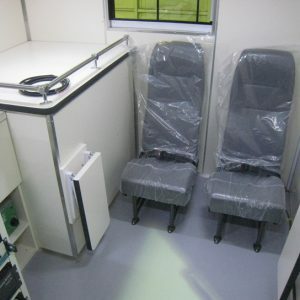 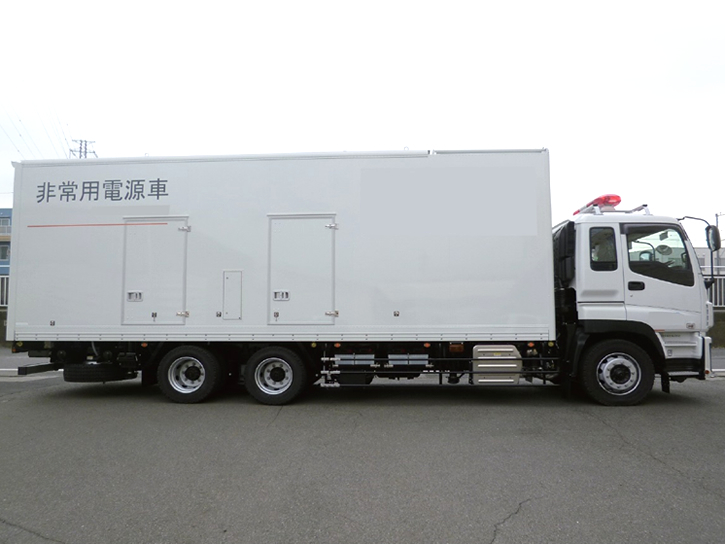 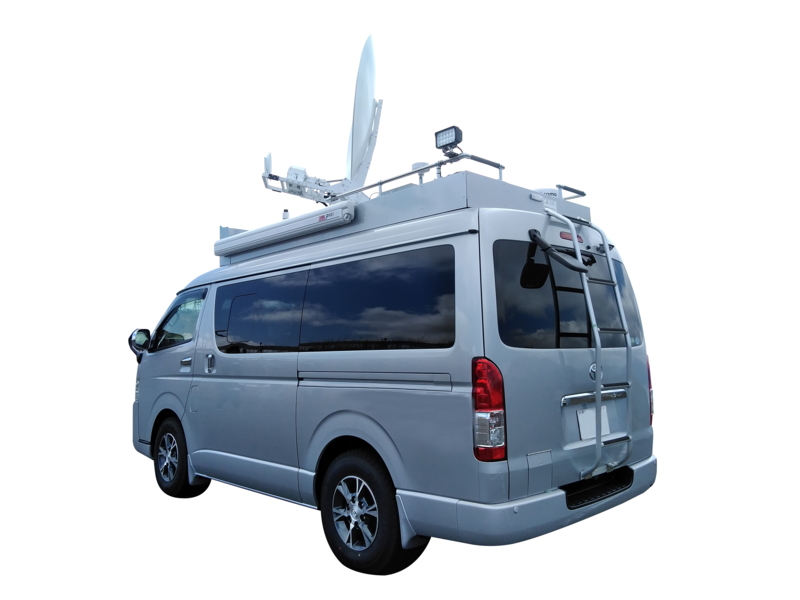 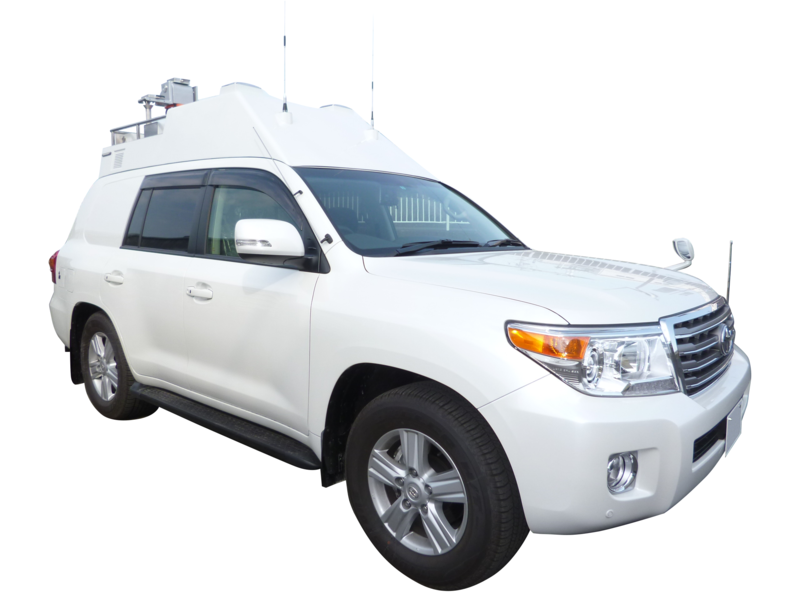 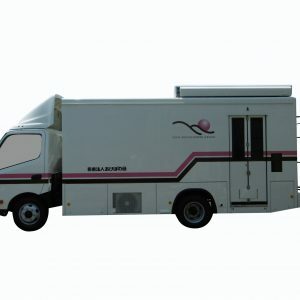 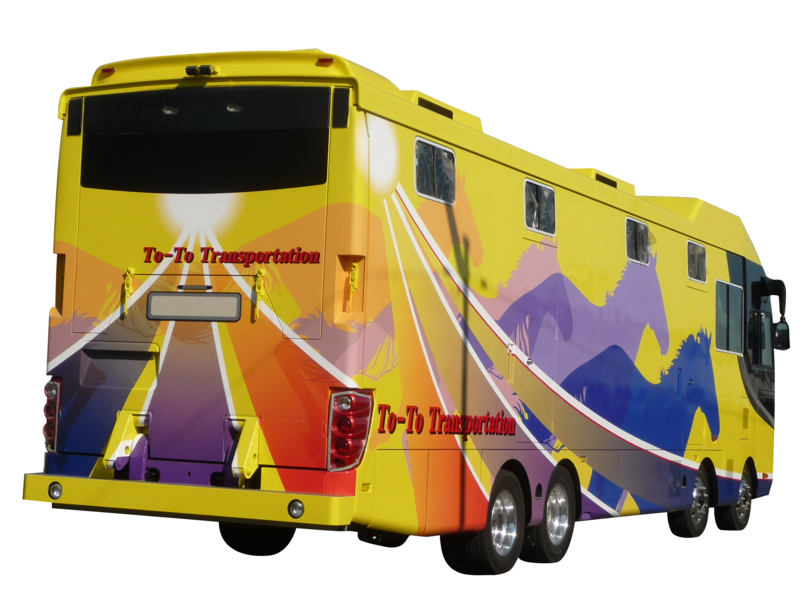 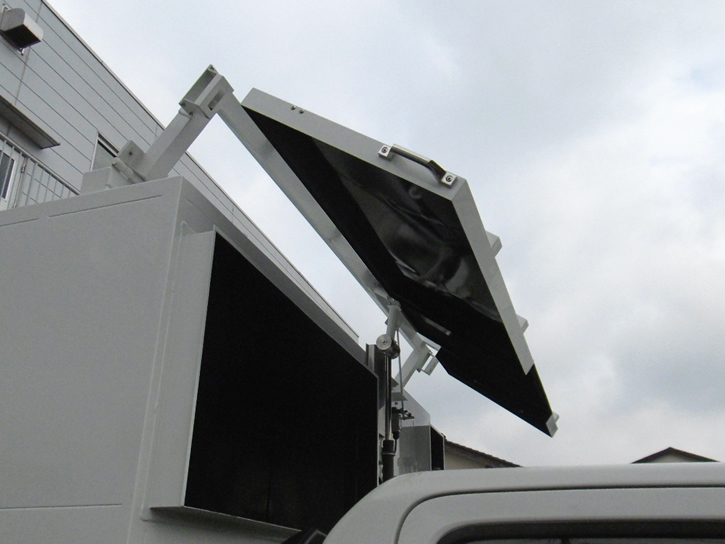 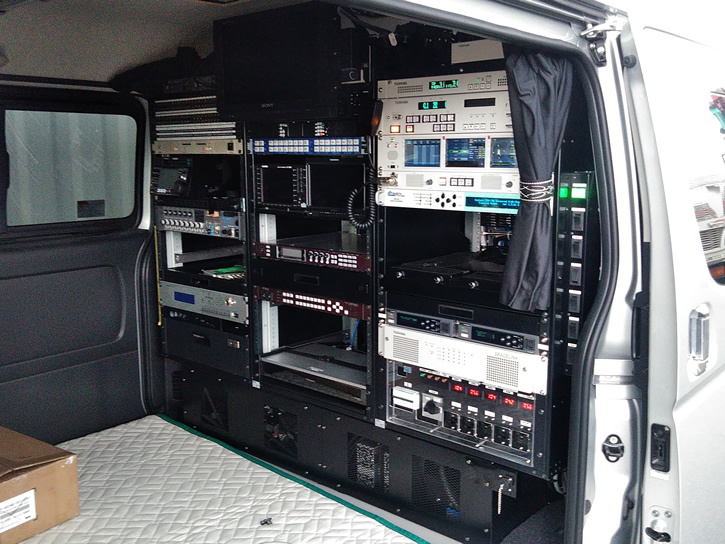 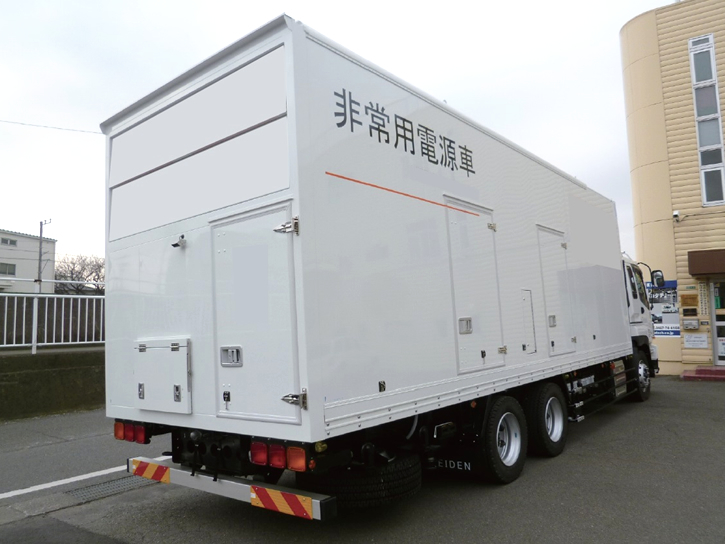 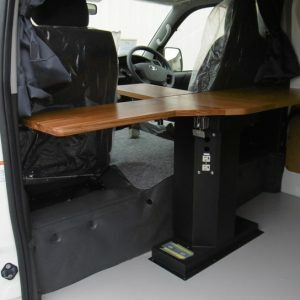 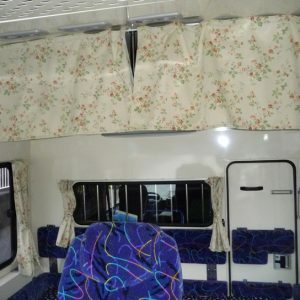 A vehicle that covers and relays cable TV stations. 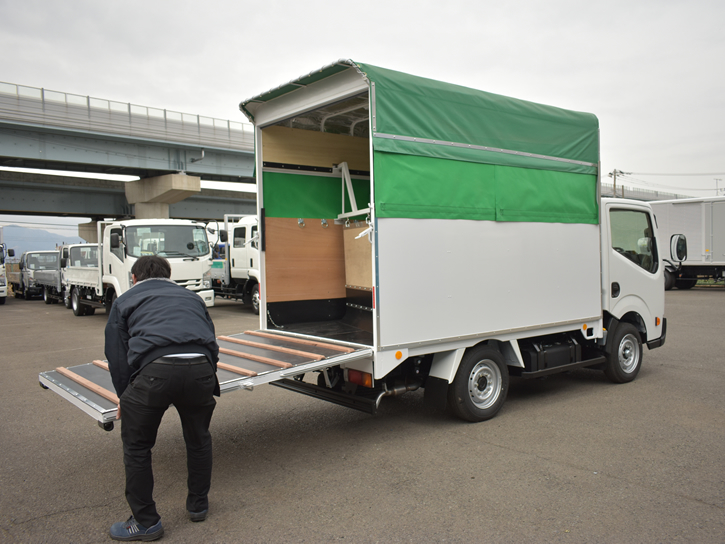 It can be manufactured on a small truck, one box base. 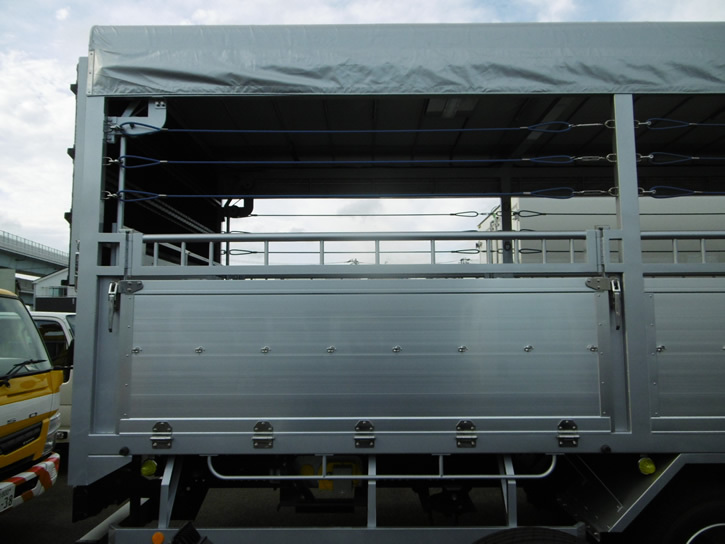 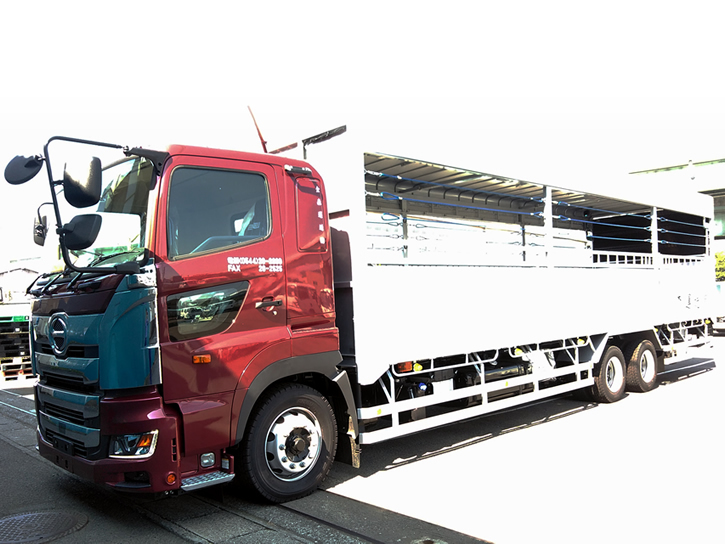 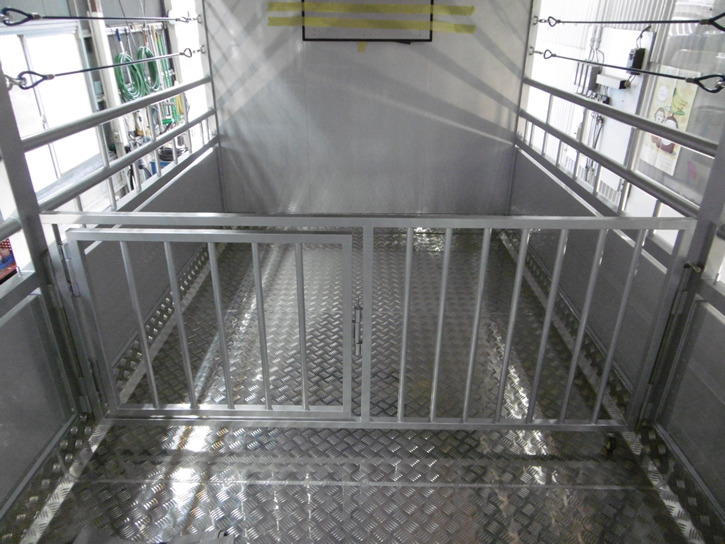 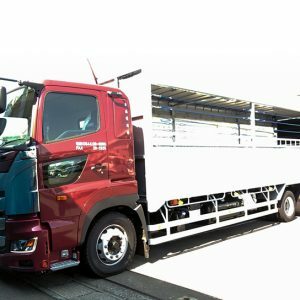 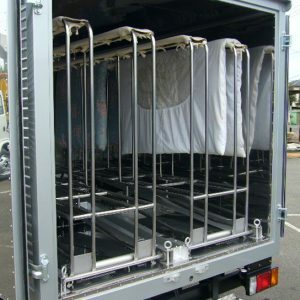 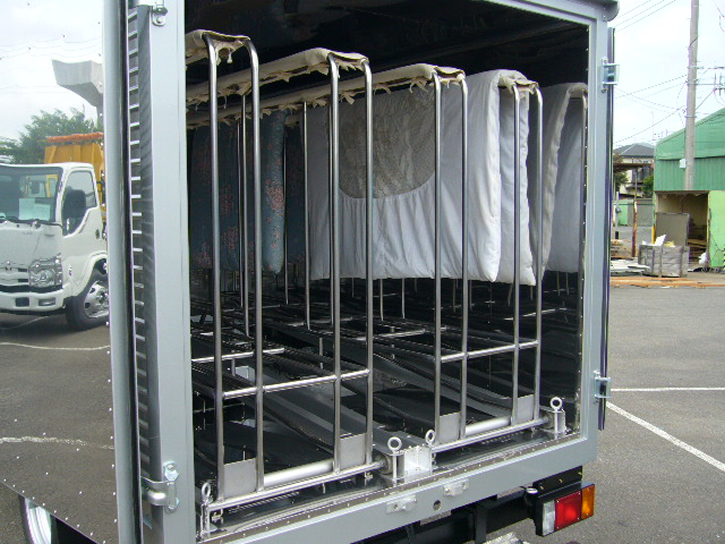 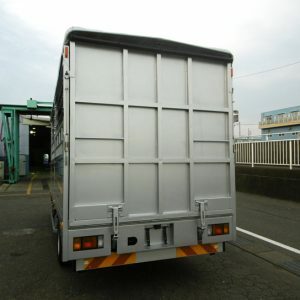 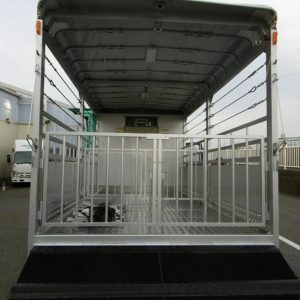 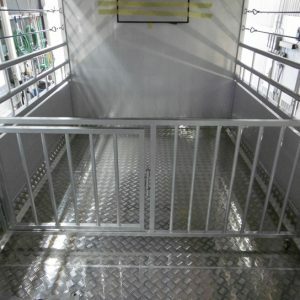 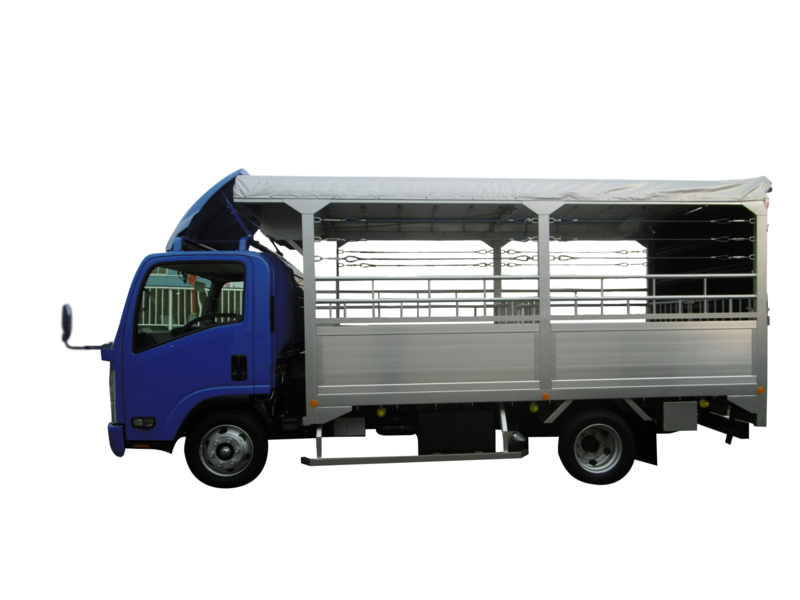 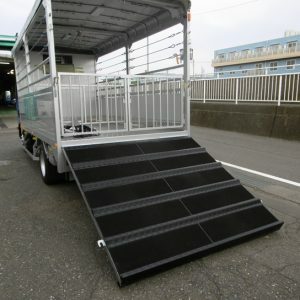 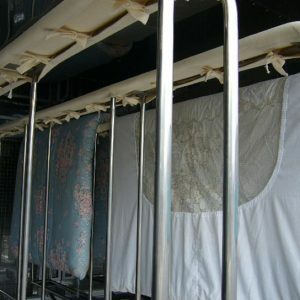 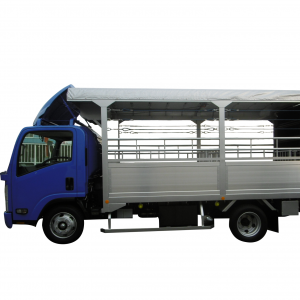 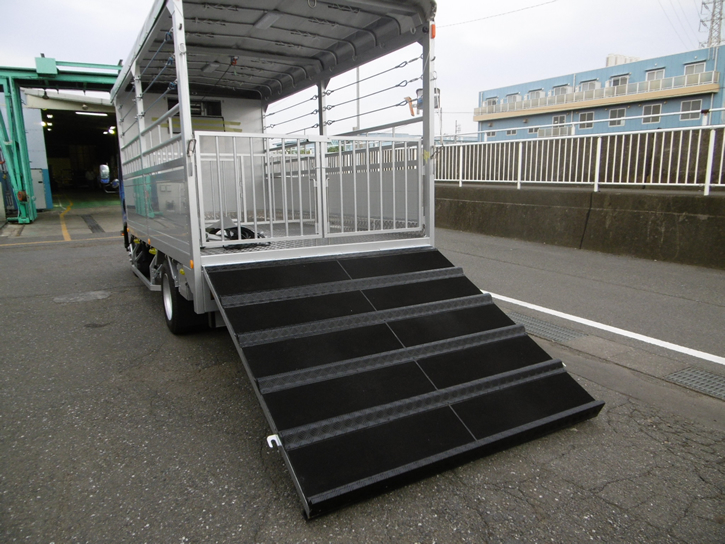 Vehicles for transporting domestic animals such as pigs and cows. 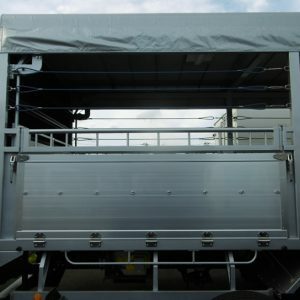 The rear large door becomes a slope when carrying and carrying livestock. 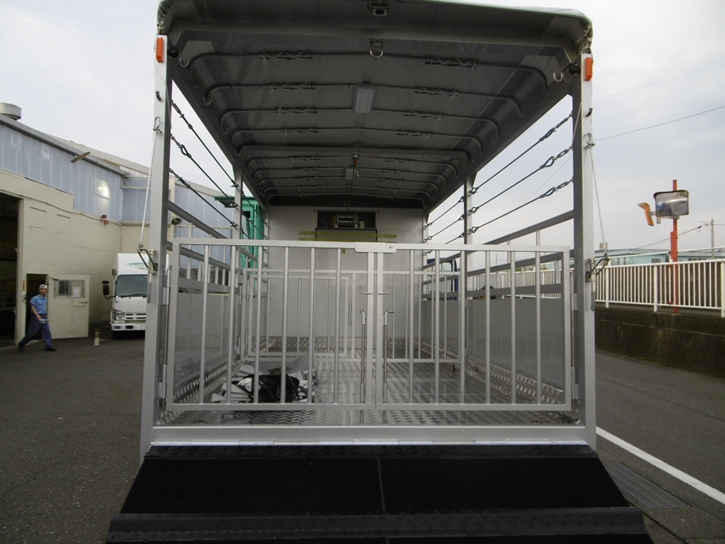 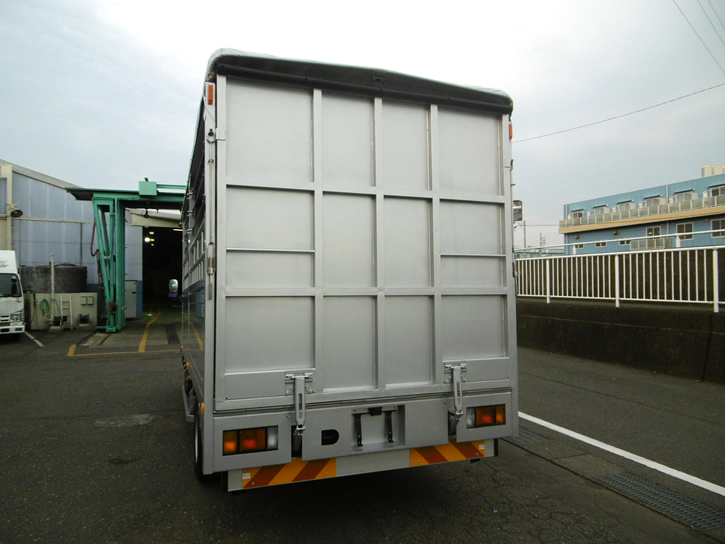 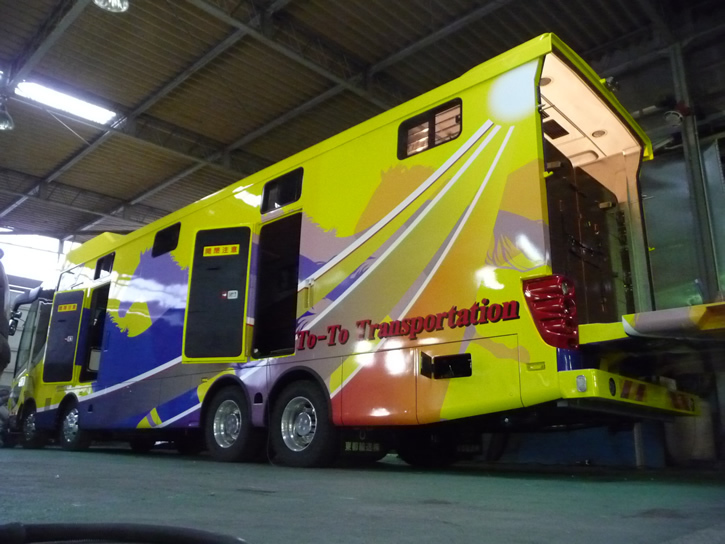 It is a private car when a pony of an animal park goes to kindergartens and primary school. 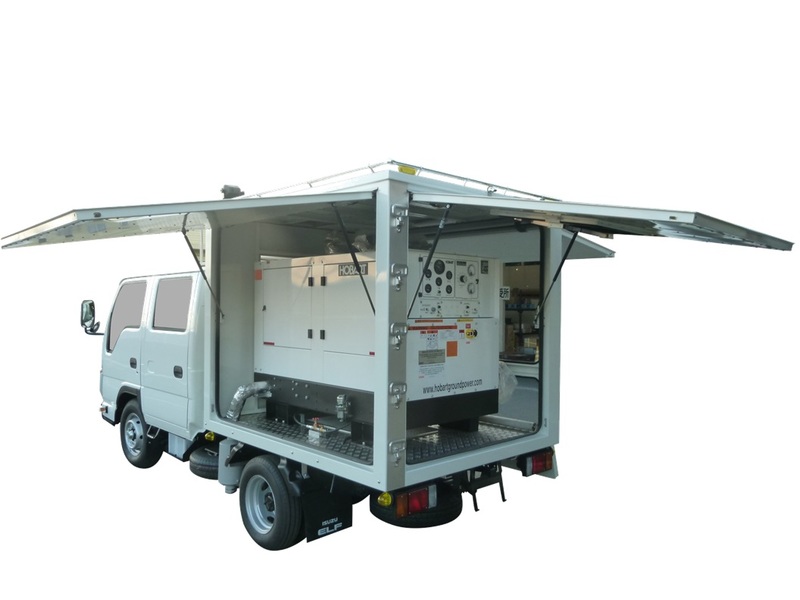 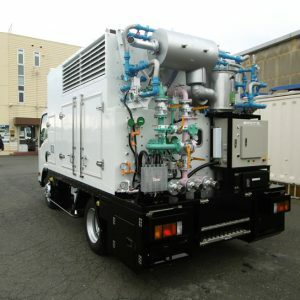 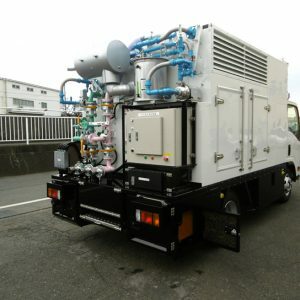 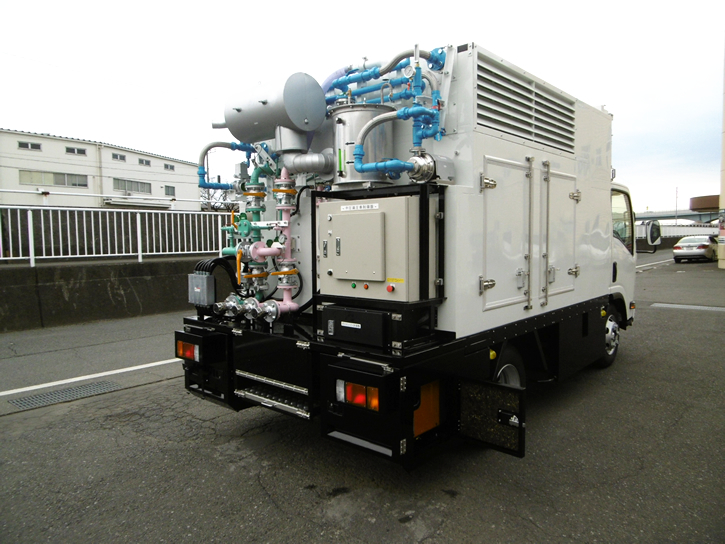 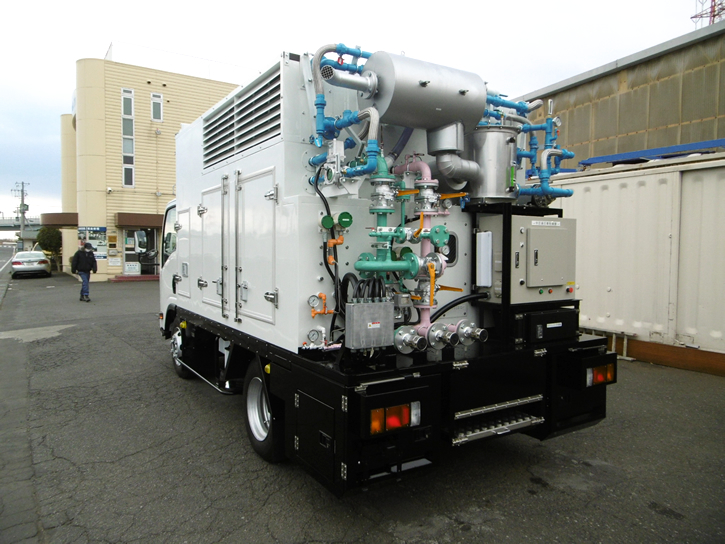 Vehicles used to supply or relay electric power to power equipment. 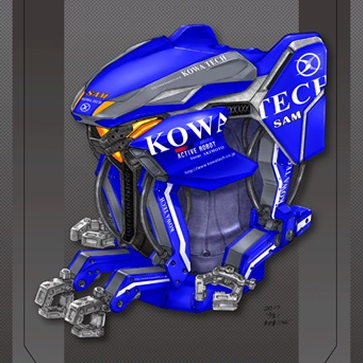 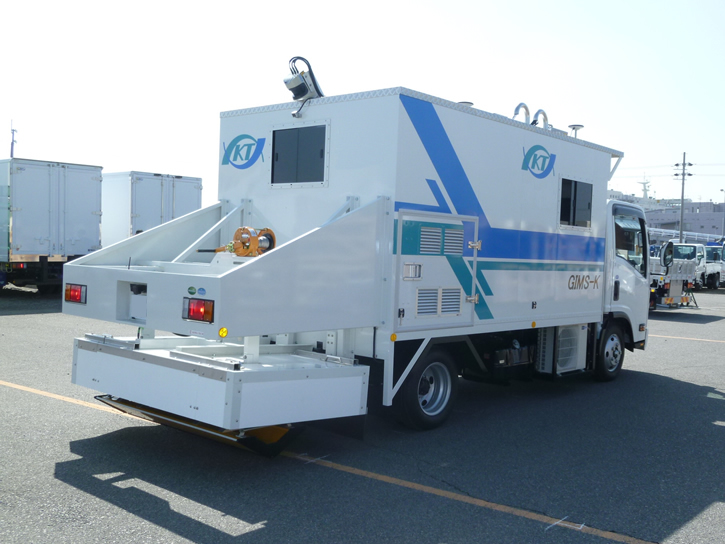 A vehicle for inspecting baggage. 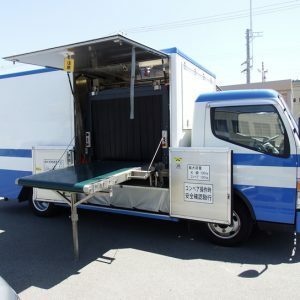 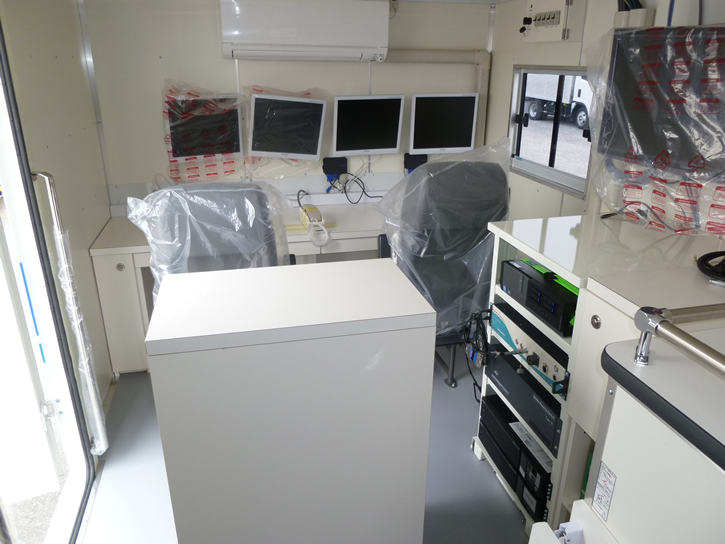 X-ray equipment is loaded in the car and inspection is possible on the spot. 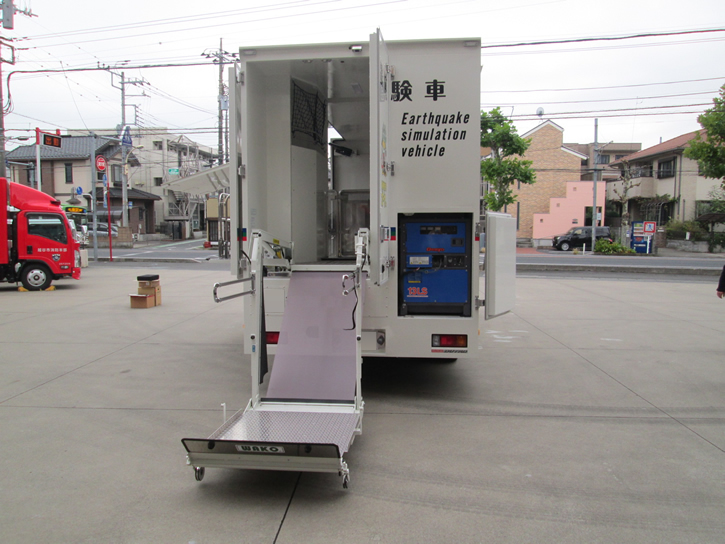 Vehicles able to simulate earthquakes” vehicles. 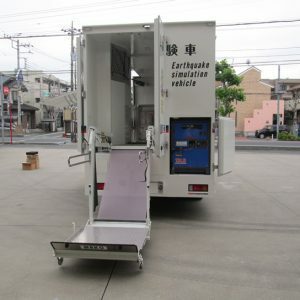 A more realistic vibration device is attached, and you can experience the shake of the earthquake that occurred in the past. 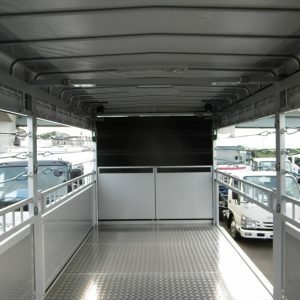 Vehicles that can use the interior of a car in a wider space. 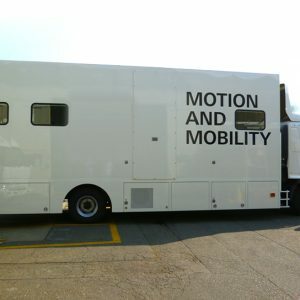 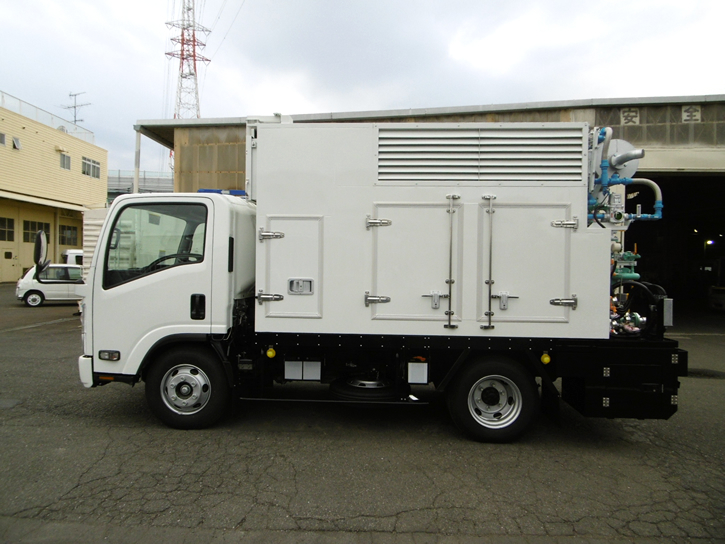 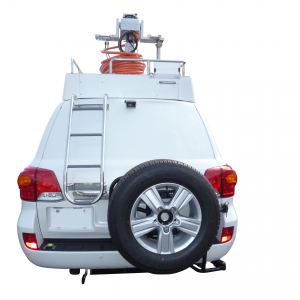 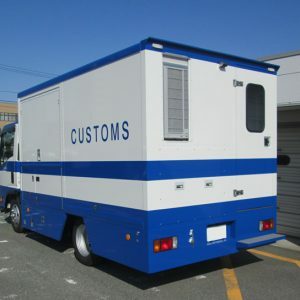 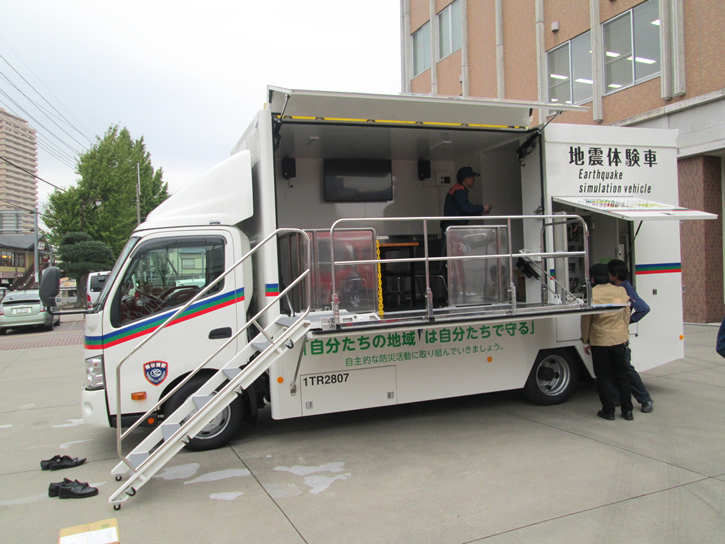 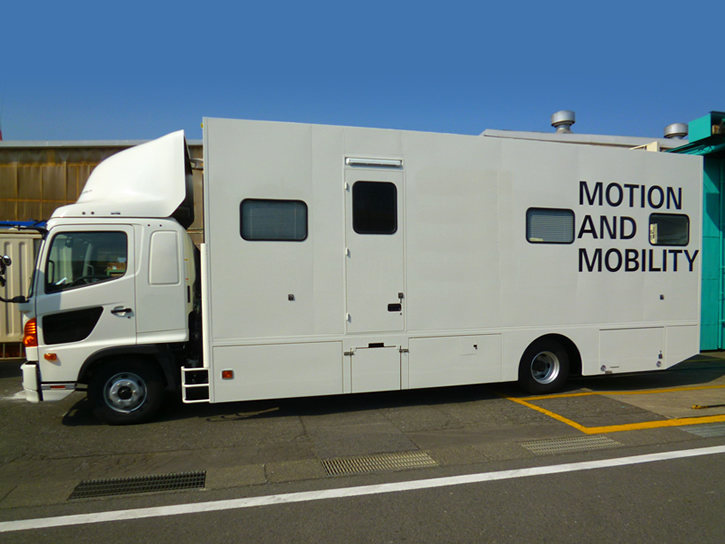 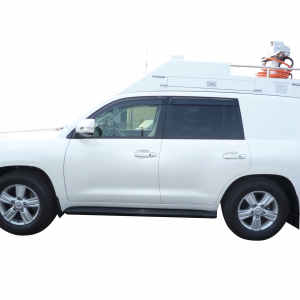 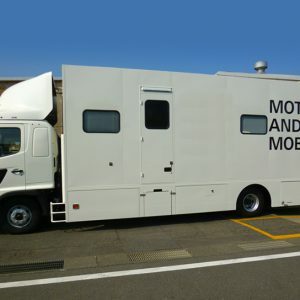 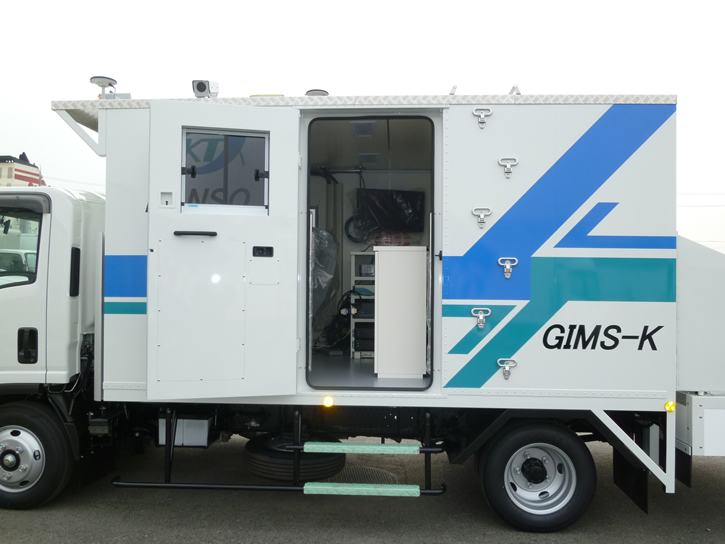 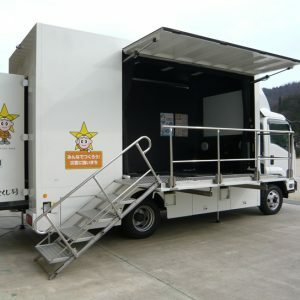 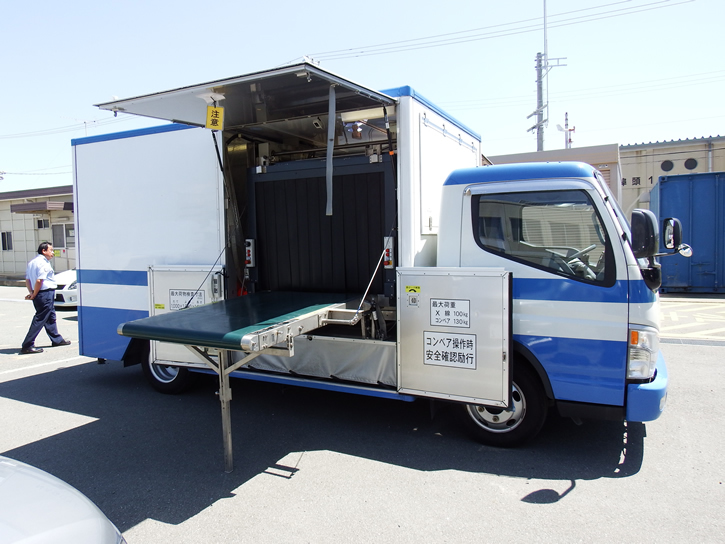 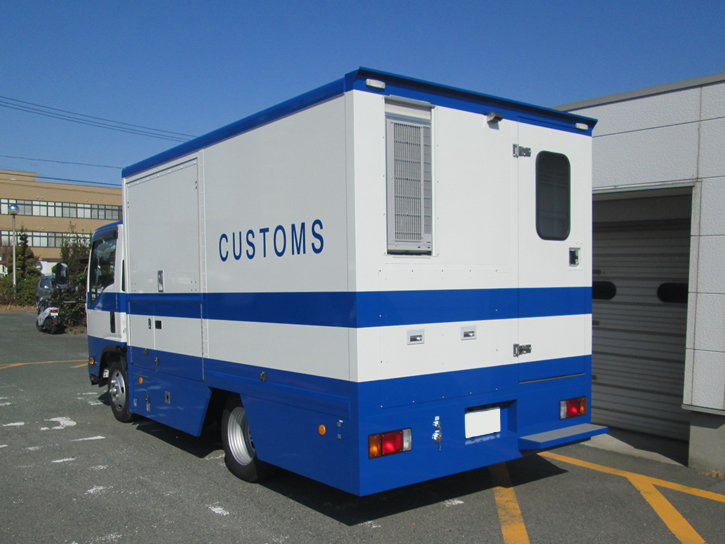 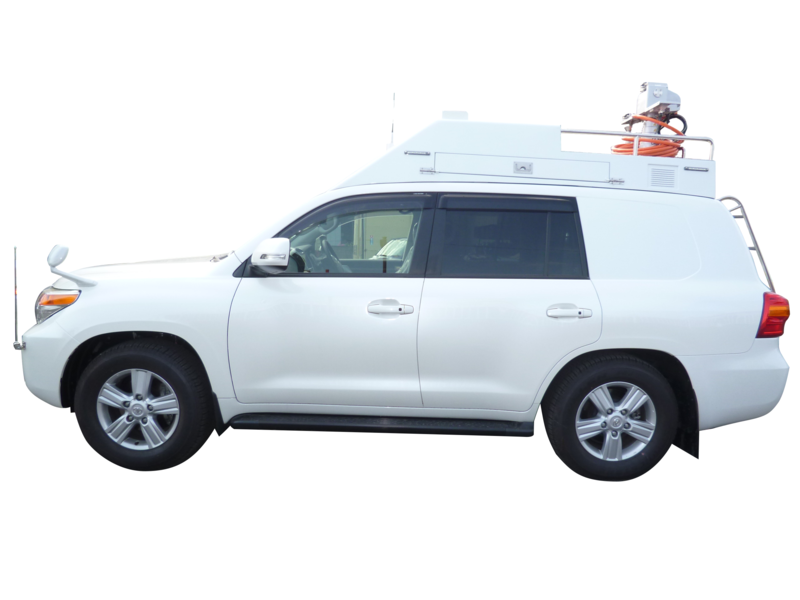 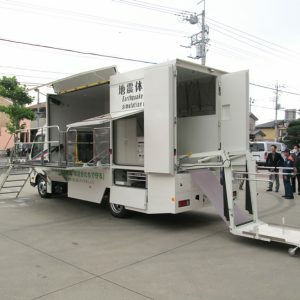 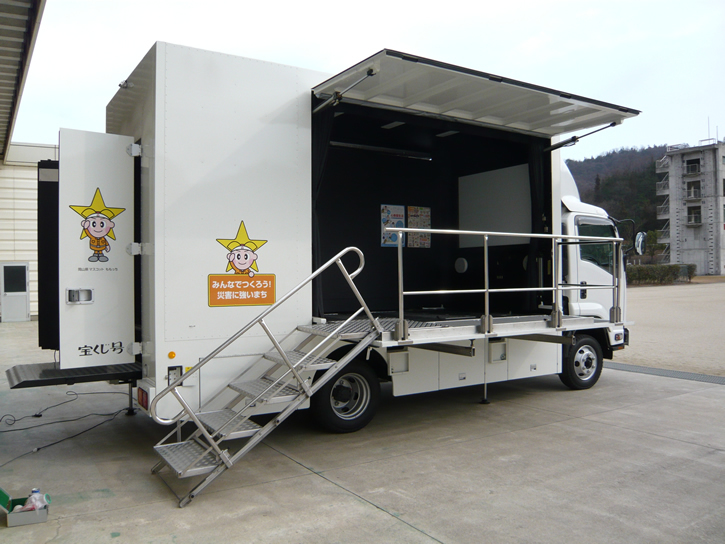 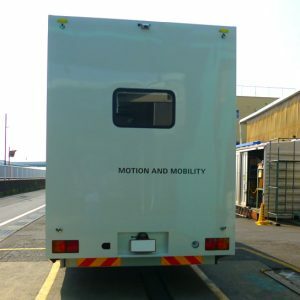 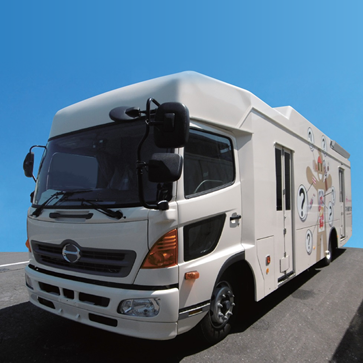 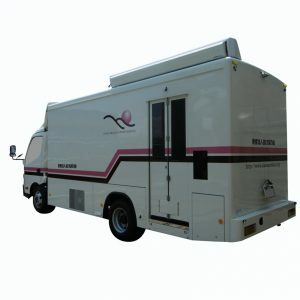 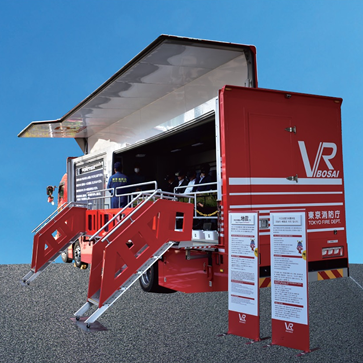 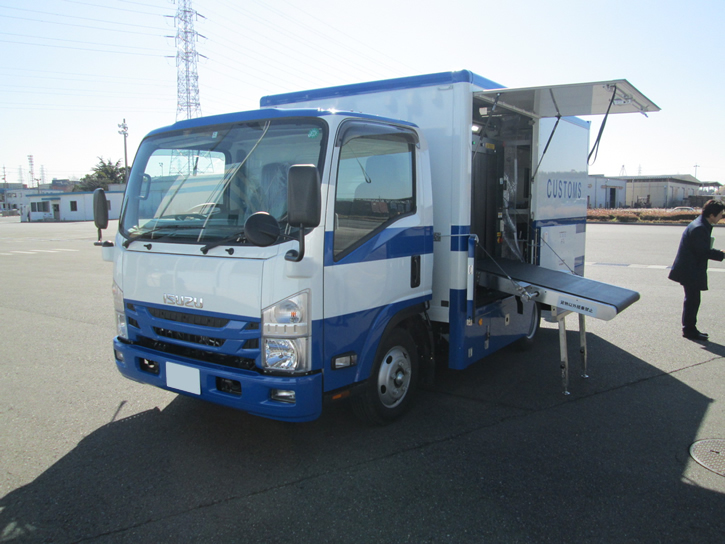 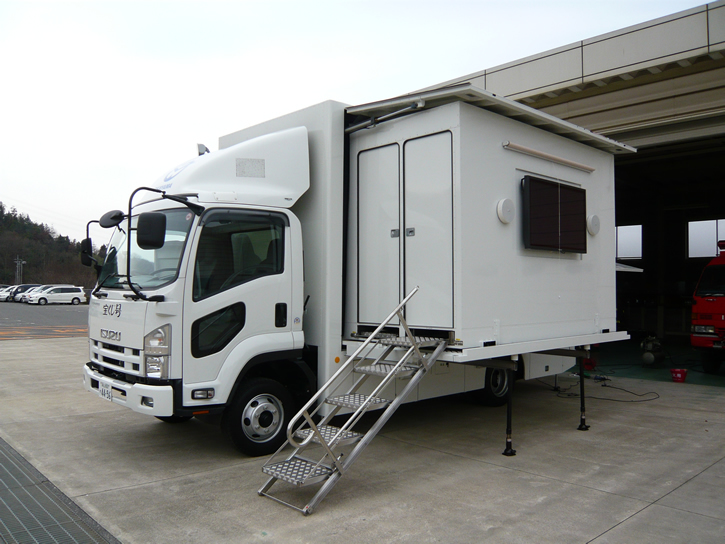 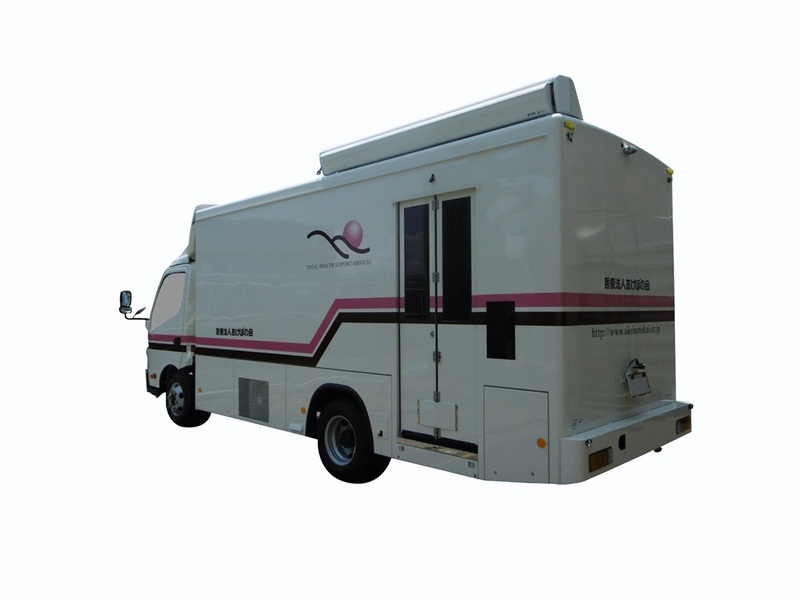 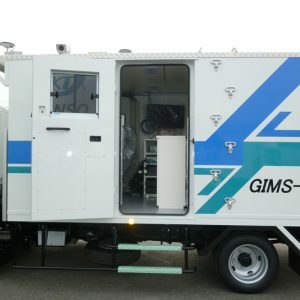 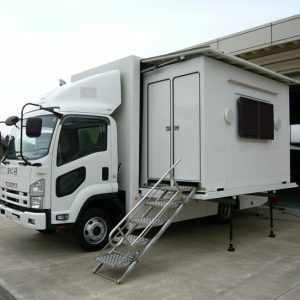 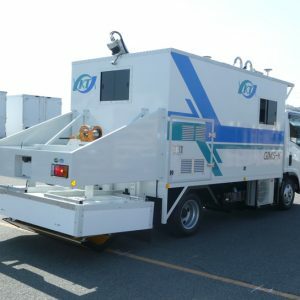 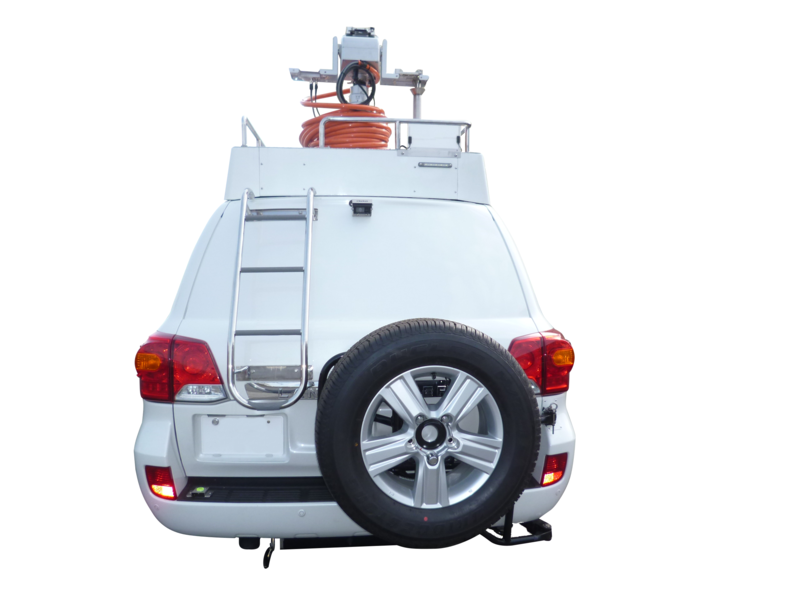 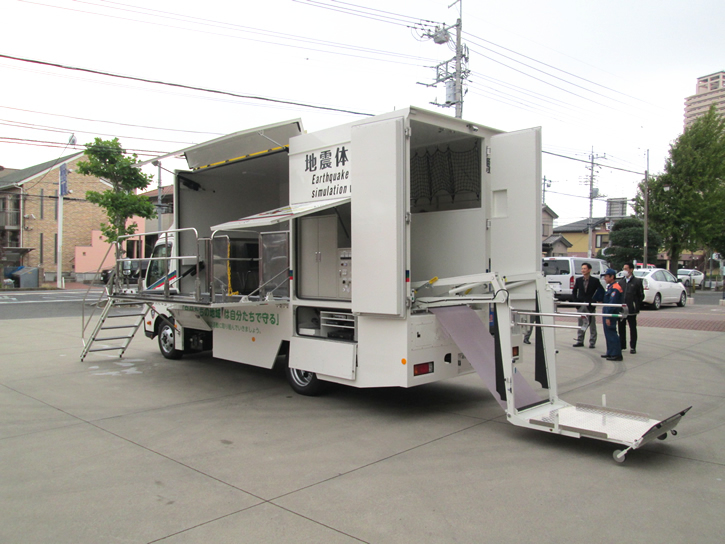 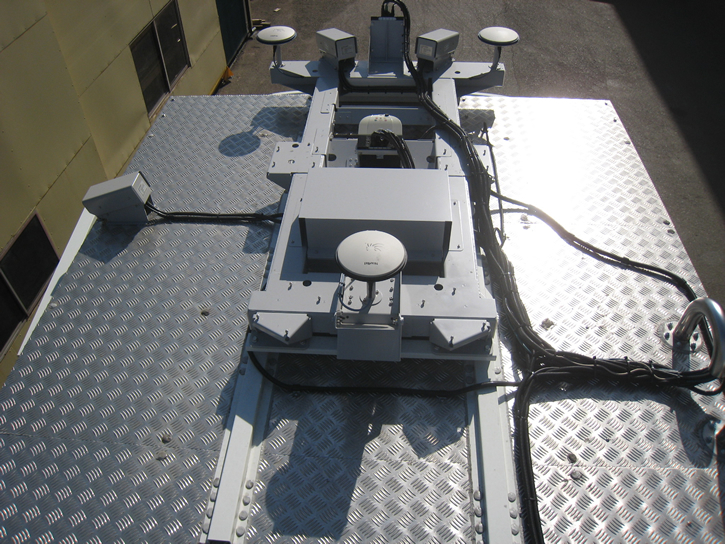 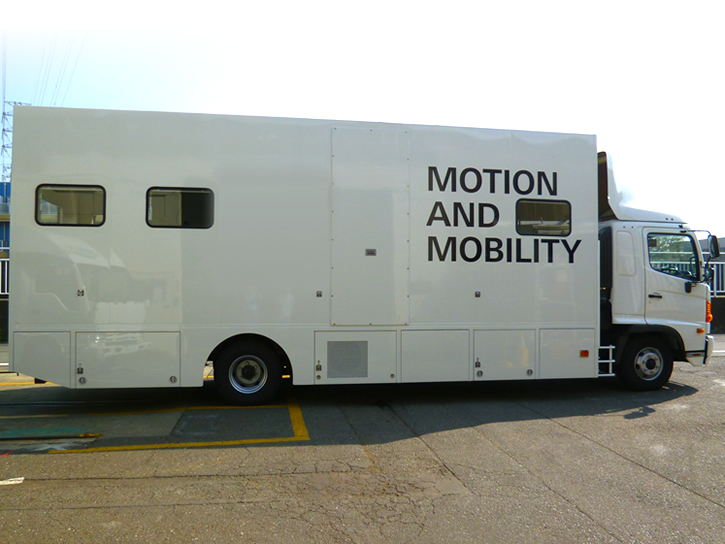 A vehicle equipped with a three-dimensional road surface diagnostic system and capable of under-road cavity survey. 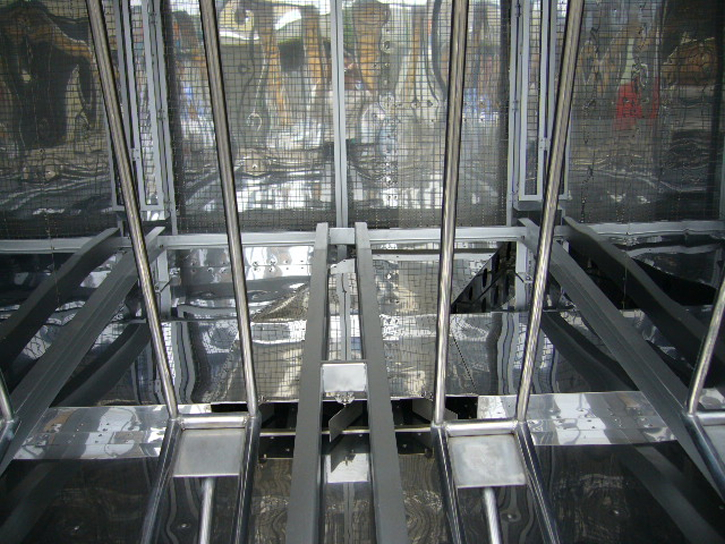 In order to prevent accidents caused by road collapse, it is possible to investigate underground without stopping the road. 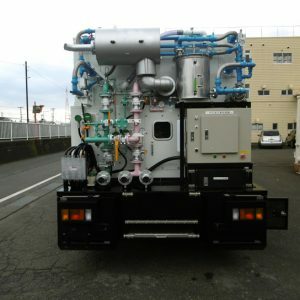 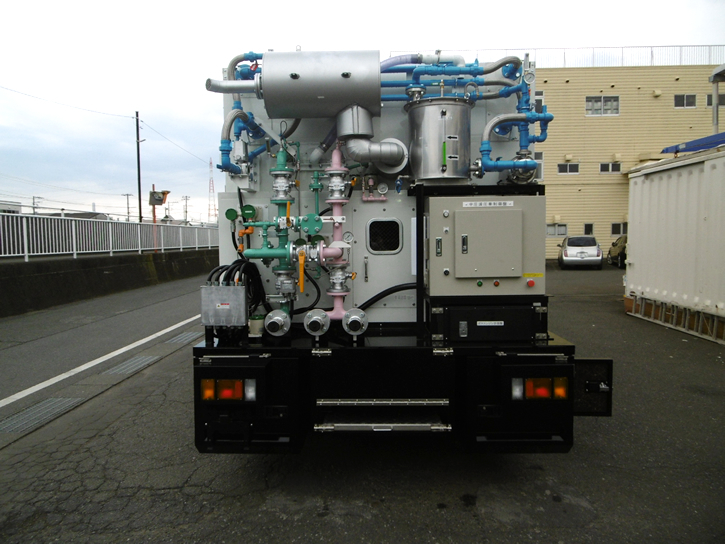 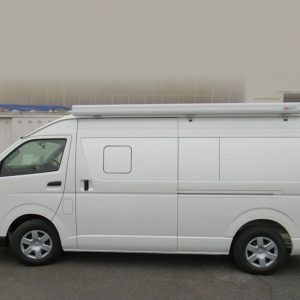 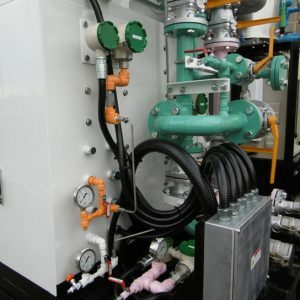 Vehicle for replacing gas in gas pipe. 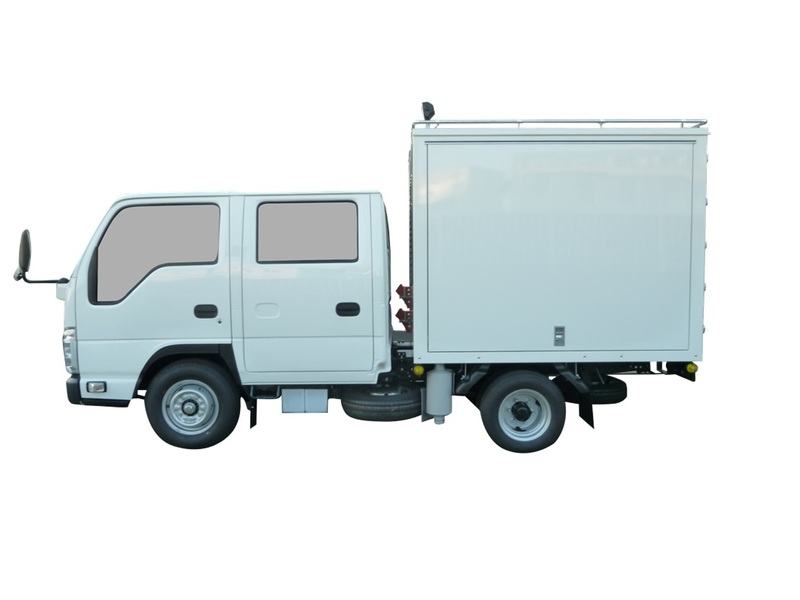 Vehicles to be serviced and adjusted. 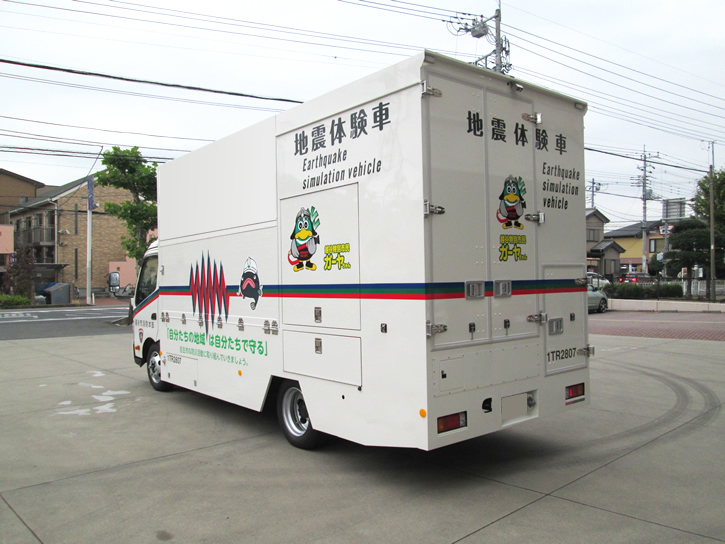 Vehicles used as relay stations when it is difficult to transmit and receive cellular phones.